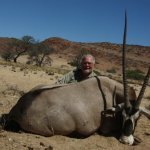 For the coming hunting year, I have two specials to offer. 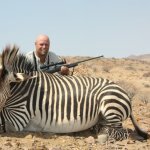 I am proud that there are not many changes to the prices for 2017 from 2016. 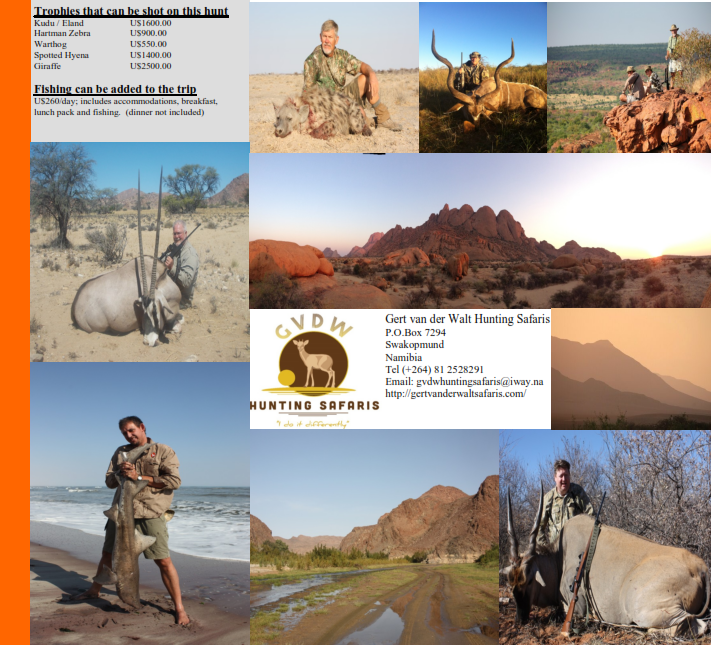 You can also print out my hunting safaris brochure from 2016 for prices. 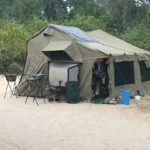 I have also a new tented camp we will use mostly to hunt Gaingu conservancy and some areas around there. 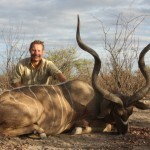 It is on remote private land and offers a truly wild feeling for a hunting safari. 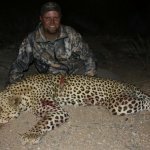 The leopard available to hunt is very much lower for 2017. 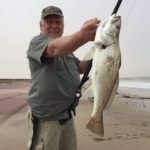 I have only 3 for the year. 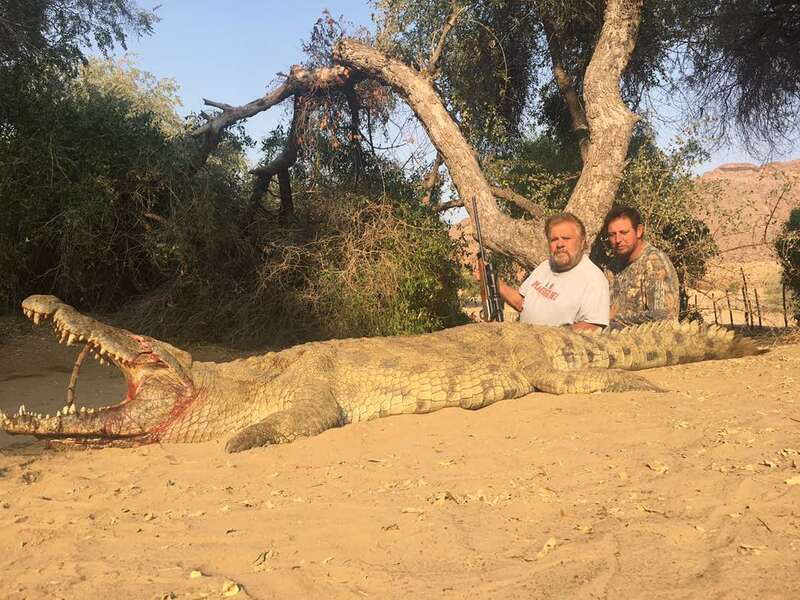 I also have 1 elephant and 1 crocodile for this year. 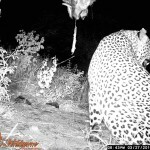 If you are interested in these species, do reach out promptly. 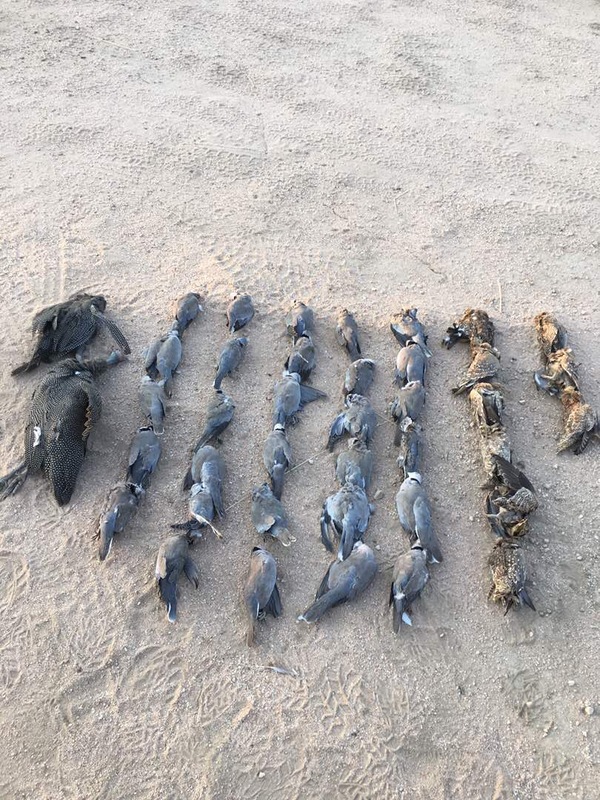 It was and still is a very dry all over the country and especially in the west where most of the hunting takes place. 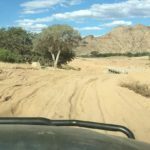 As 2015 draws to a close and the dust finally settles over the bush and veld, I now find I have the time to look back and reflect on the year and share with you some of the high lights and what to look forward to in 2016. 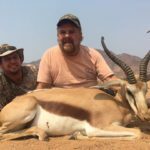 The year started with some new hunters and a friend from Australia who did a Safari in the Puros Conservancy and what a great time this was. 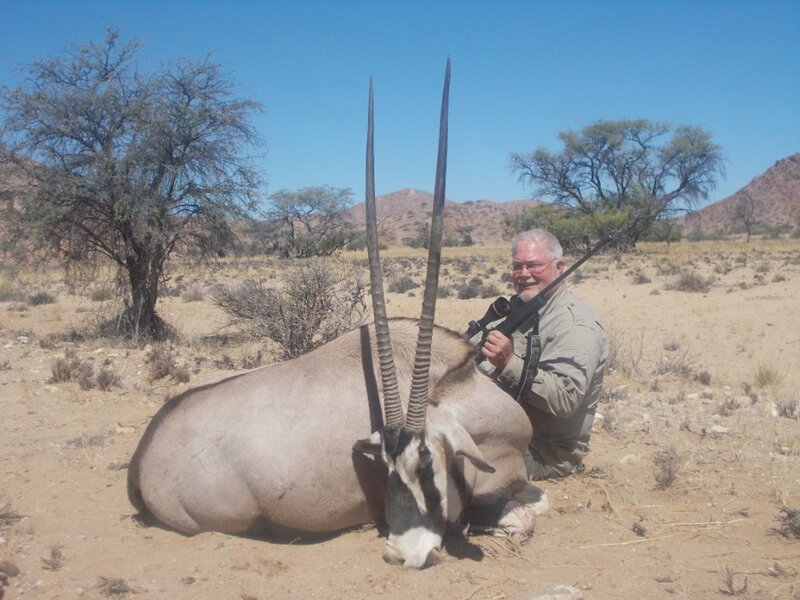 3 Oryx over 38 inch were harvested in this hunt along with 2 Kudus, one of 56 inches and another of 58 inches. 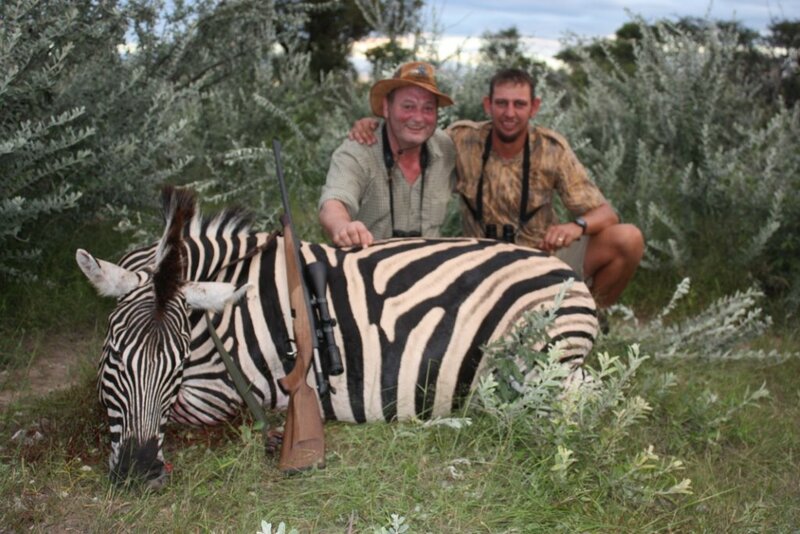 Fantastic examples of the trophy quality in this area. 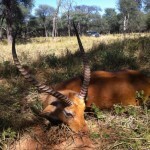 Our safari concluded with a Letchwe and some other trophies as we ended the hunt in my Waterberg area. 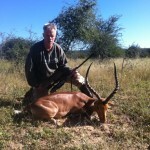 As I dropped this wonderful group of hunters off at the airport, I met my next client, a fellow from New Zealand. 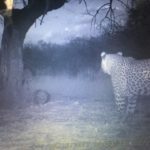 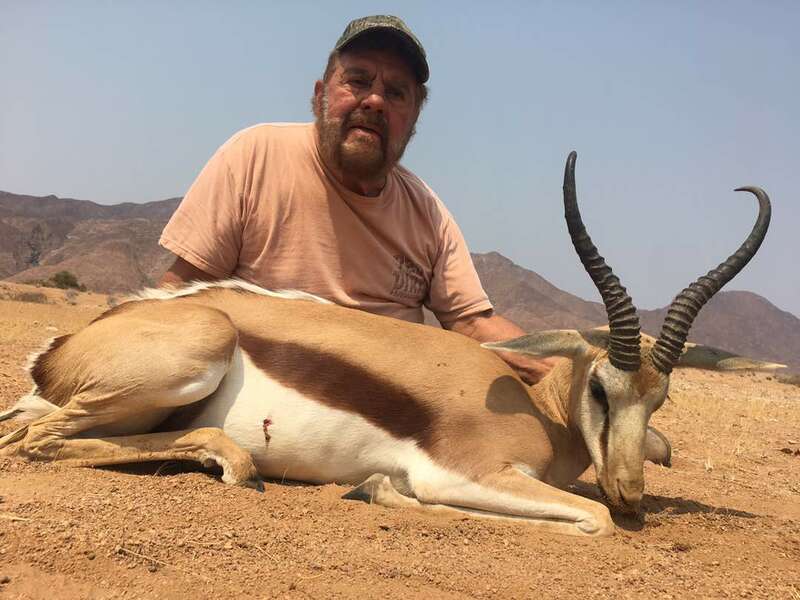 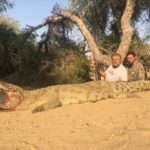 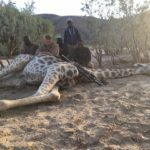 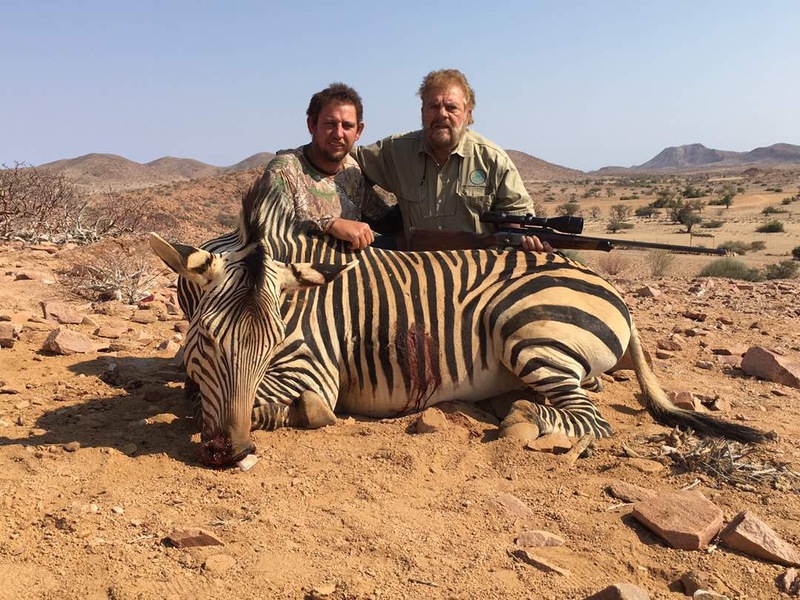 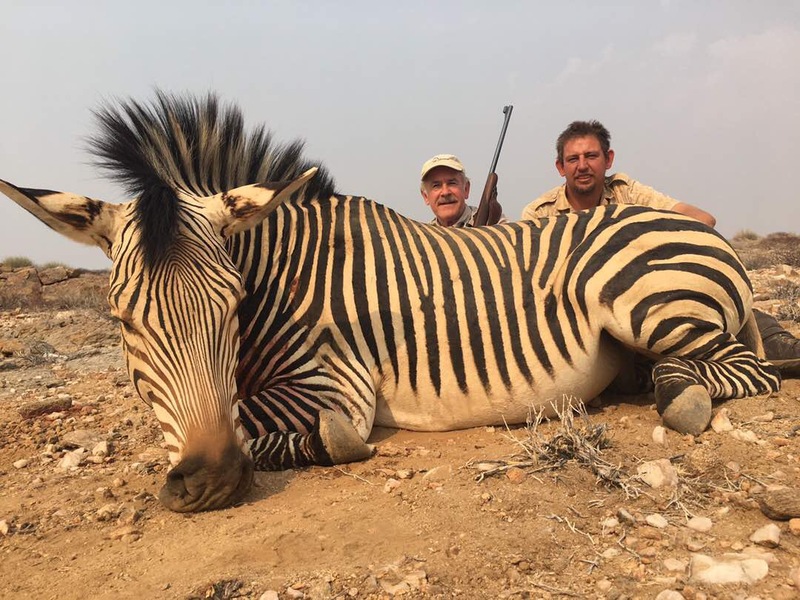 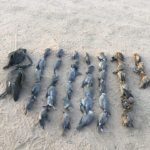 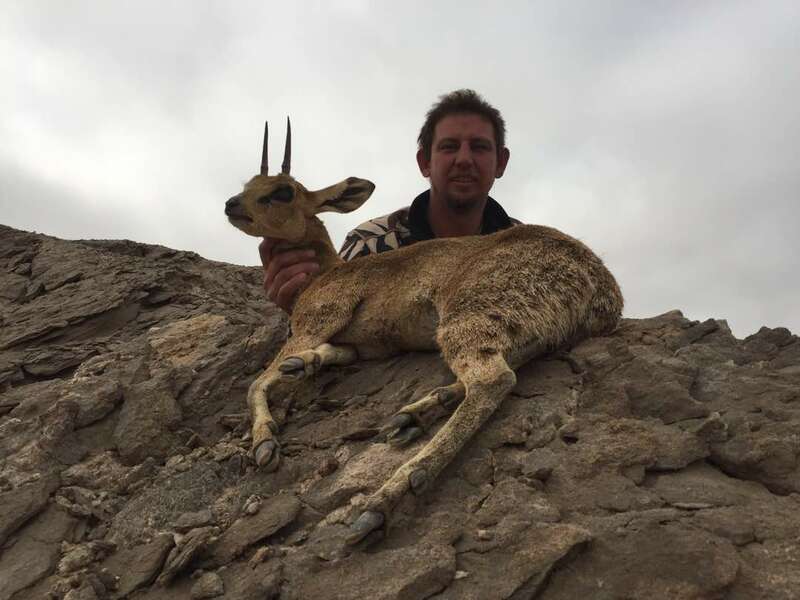 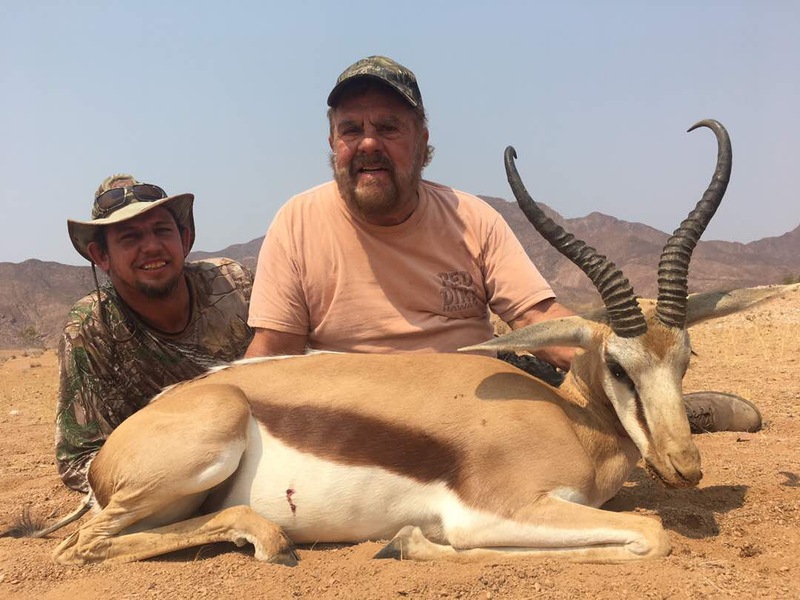 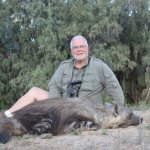 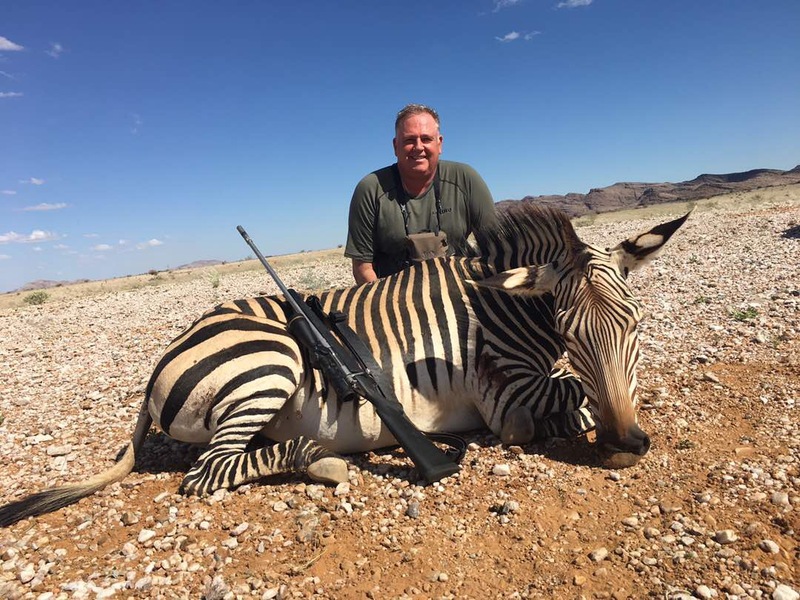 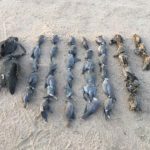 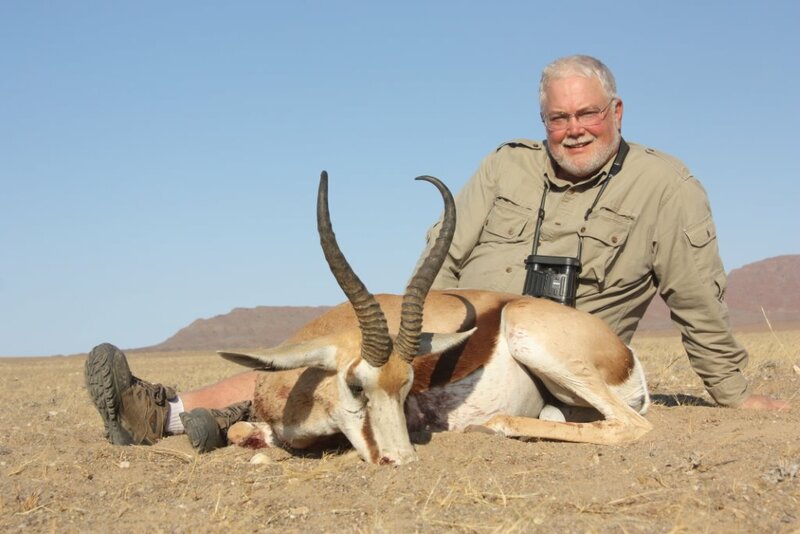 This also turned out to be one of the nicest hunts for the year, where he experienced a dream hunt and harvested a Leopard that ranks in the Top Ten of Namibian records. 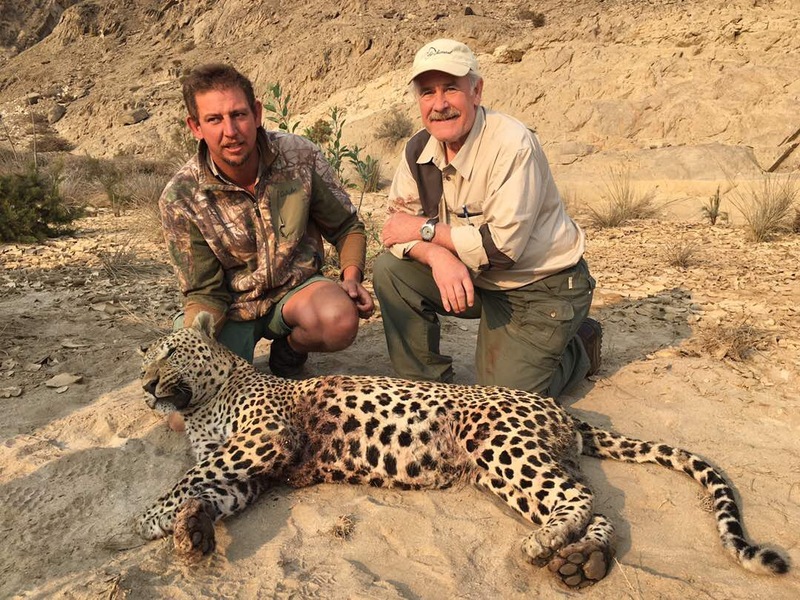 With the cold winds blowing and nothing going by plan, the leopard showed himself one morning on a hill side and the hunt ended with a wonderful long range shot. 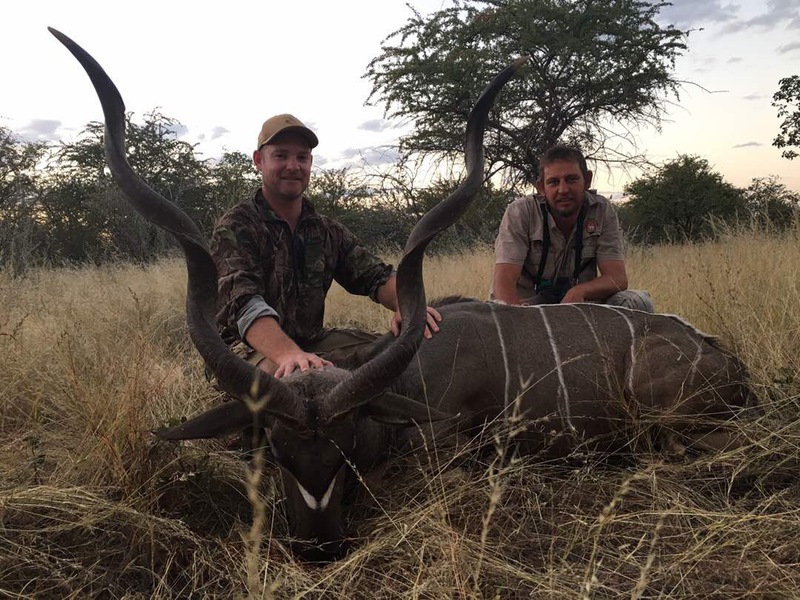 But as this was only the beginning of the Safari Season, I know that it will be a wonderful and busy year with some great hunts still to come. 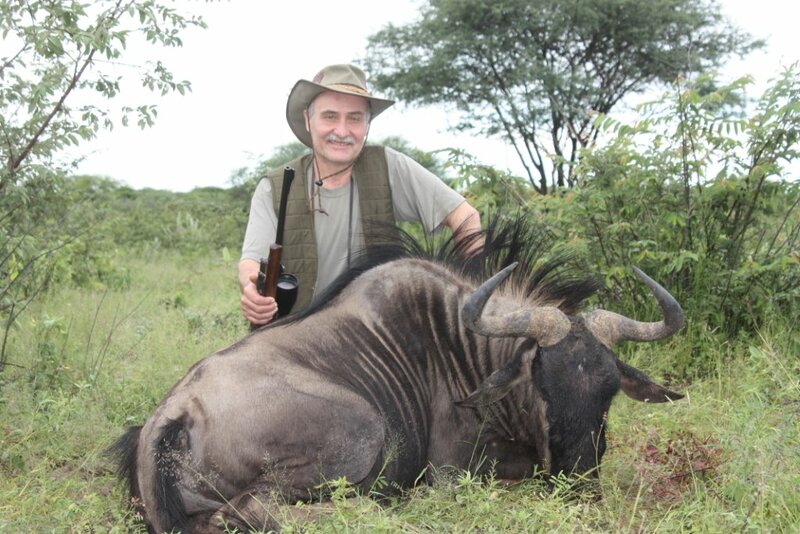 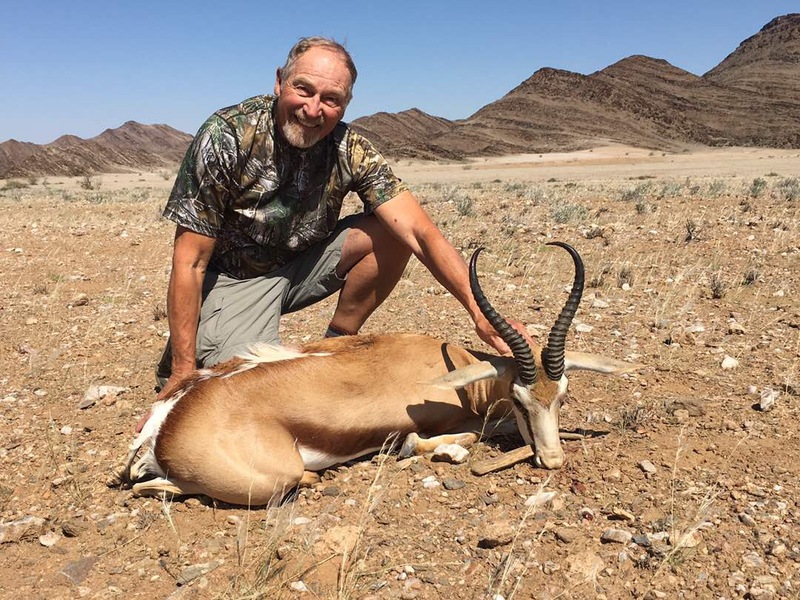 One of my next Clients was Jim Shockey and he had a very successful hunt harvesting a Brown Hyena in 3 days in broad daylight on bait and a 37 inch Oryx in Puros conservancy with his rifle. 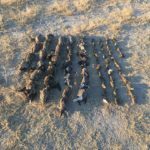 This was a great hunt and what a wonderful time we had in just a few days. 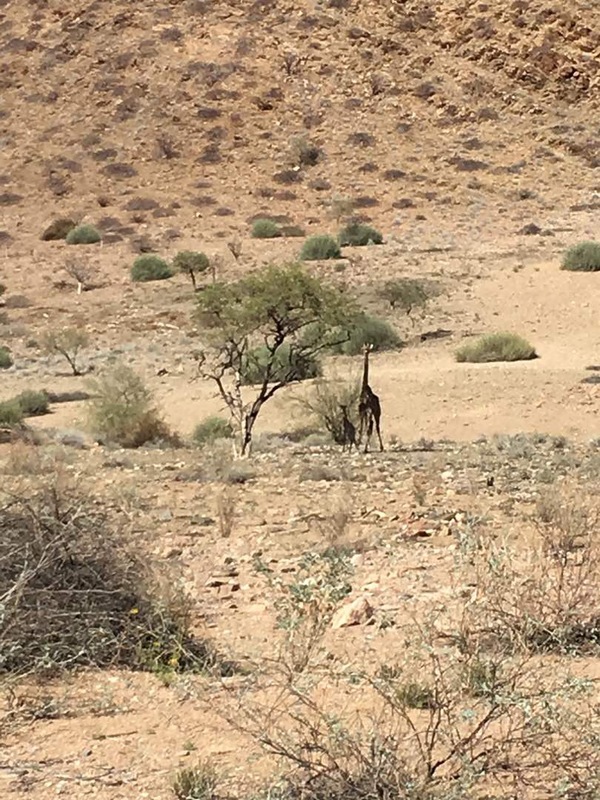 Old friends arrived next and we once again headed back into the desert. 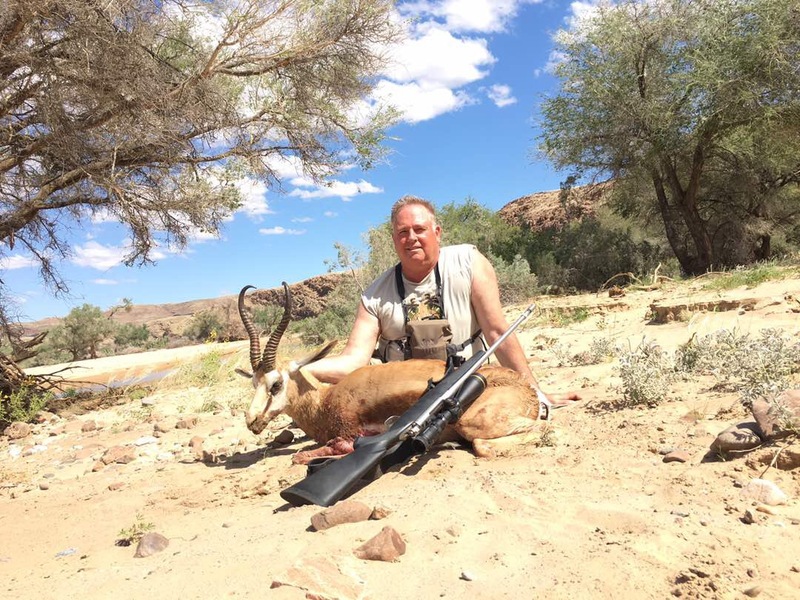 Now the drought started to catch up with the hunting areas and it was really getting dry. 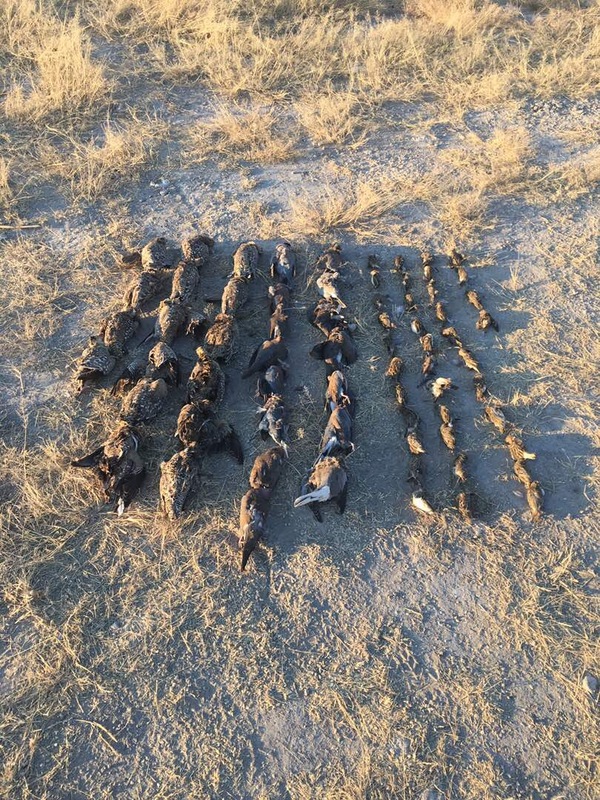 Even with the continuing drought and persistent cold winds blowing we still hunt and had a great time. 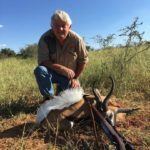 We tracked a leopard to where he had lain down in the thick bush and even with this we still got a good springbuck as the day closed. 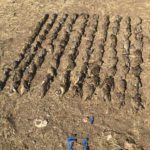 As the drought worsened and the game started to move to new areas, we had to hunt harder and further than we have experienced in many years. 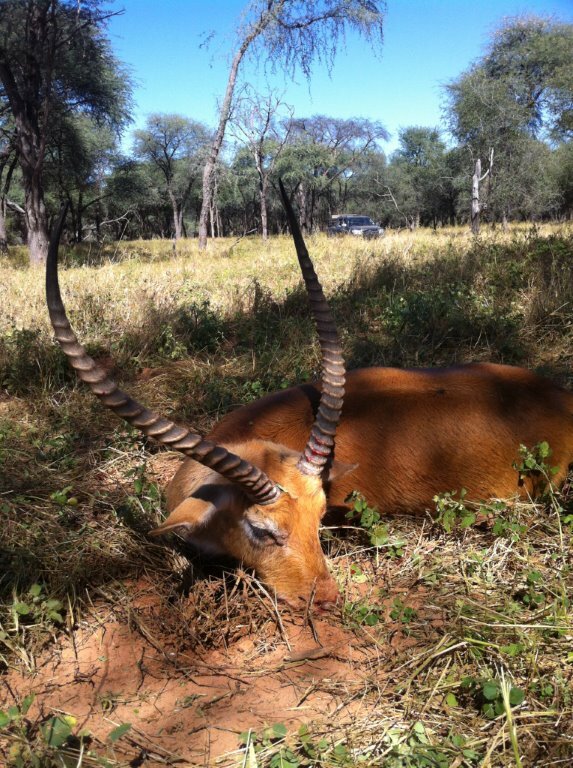 Even in places like Waterberg our hunts took us deeper into the mountains for Kudus and Eland. 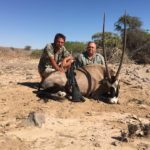 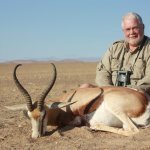 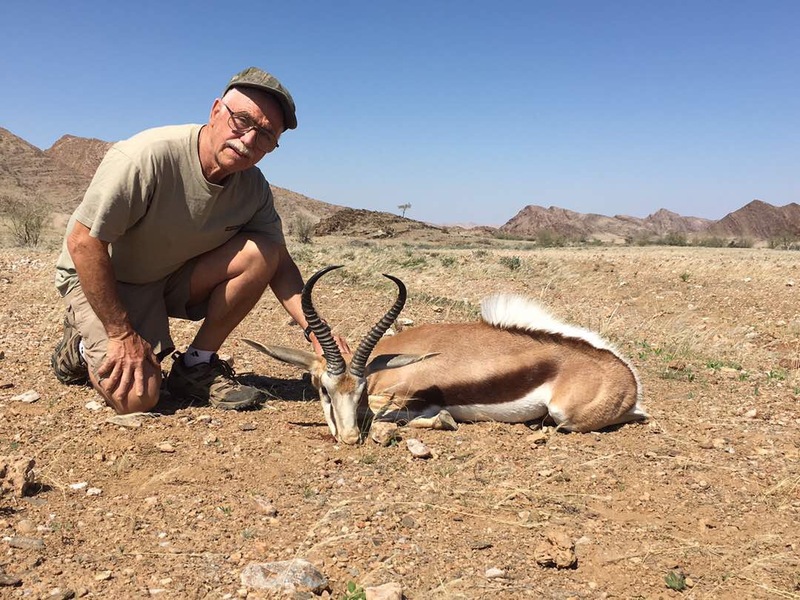 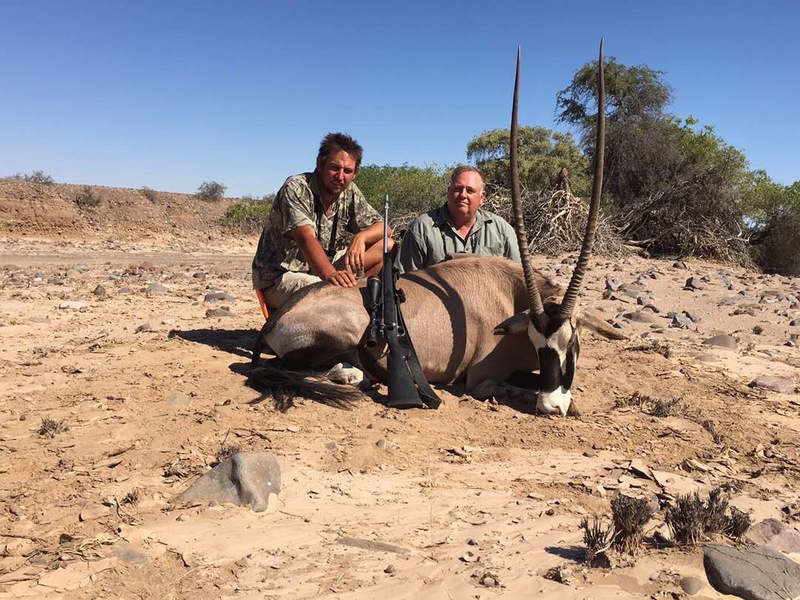 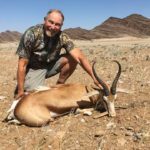 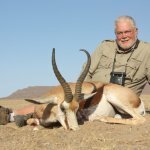 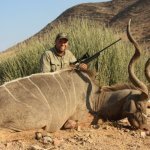 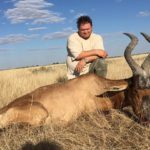 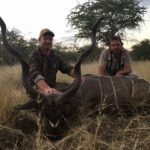 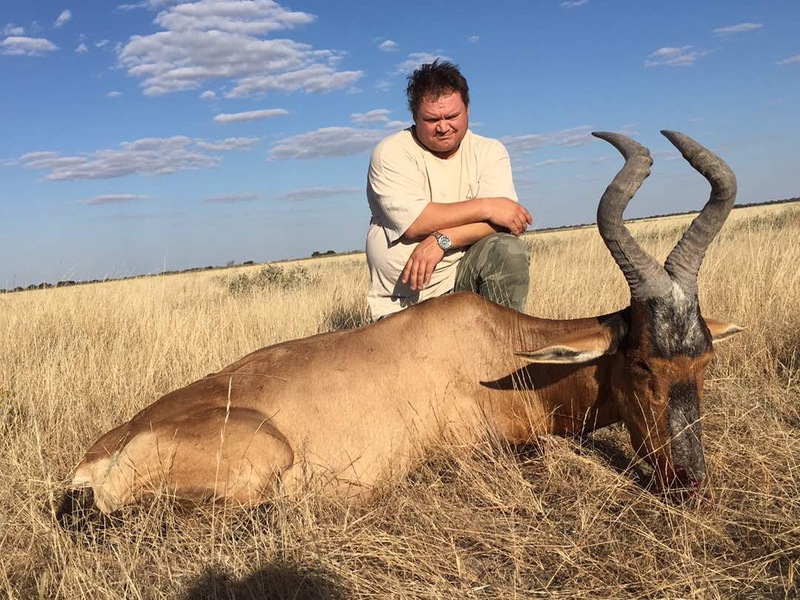 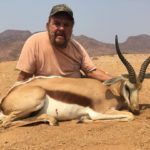 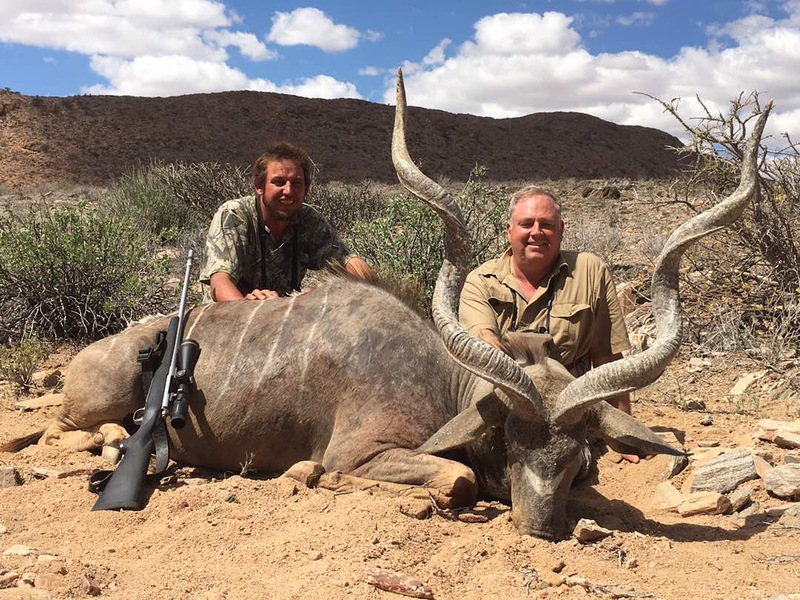 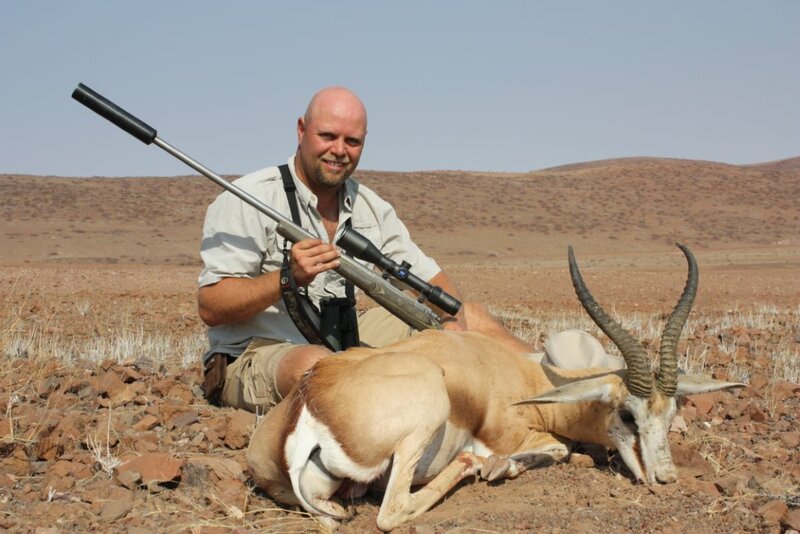 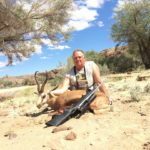 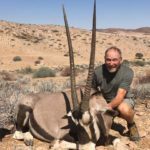 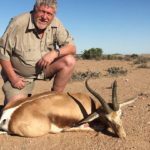 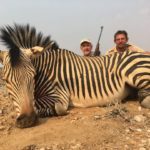 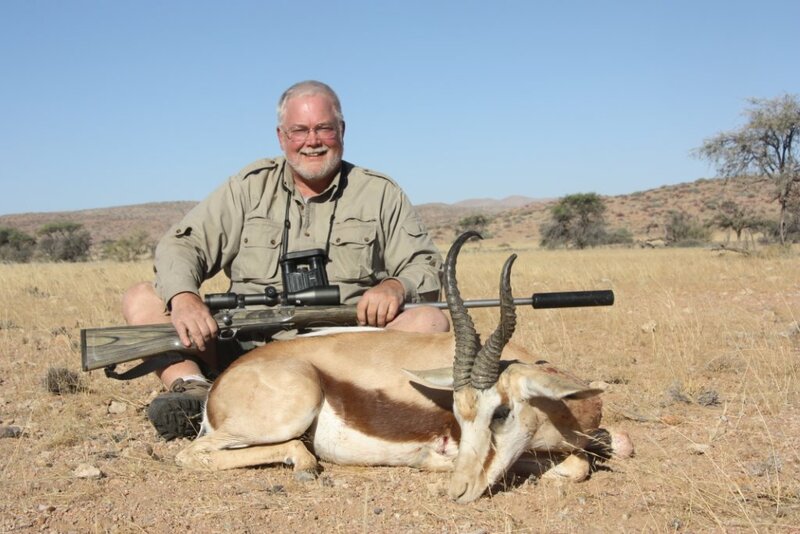 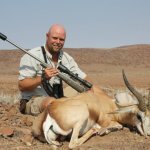 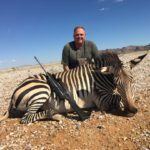 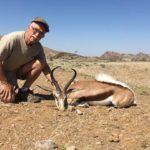 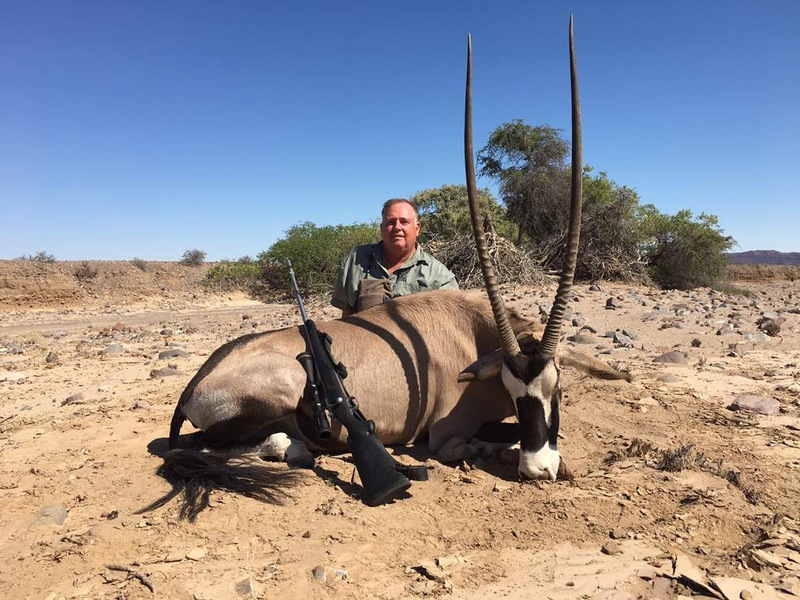 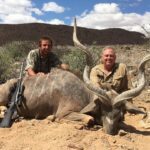 In August, I conducted hunts with 2 clients, Brain and Thomas, these were 2 Eland hunts 14 days apart, where we were tracking the Eland and on each hunt the clients were able to shoot the Eland on the first day of the hunt. 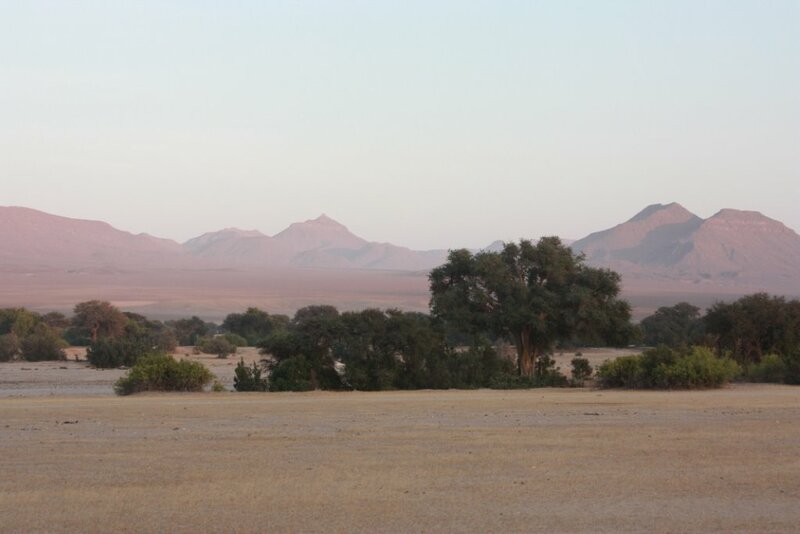 When I had some time between the hunts during the year, I located and obtained a new hunting concession, Uukawaidhi. 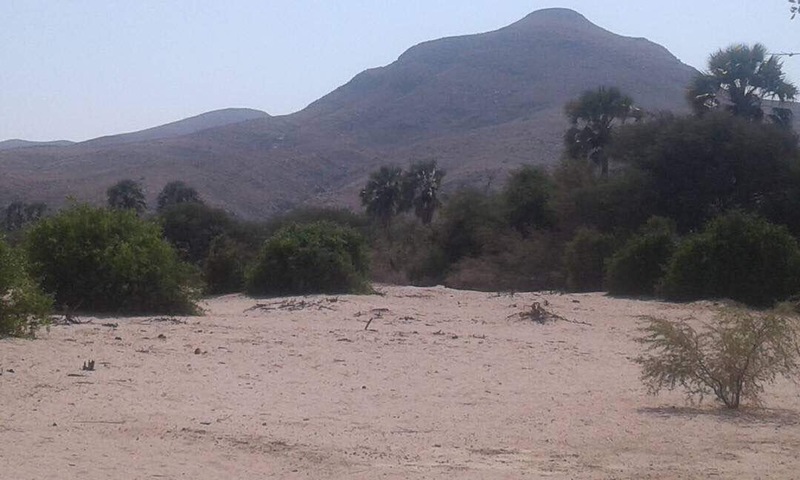 This concession borders another one of the new hunting areas of last year, Okangoro, and both these areas it turns out contain some wonderful elephant and leopard hunting opportunities. 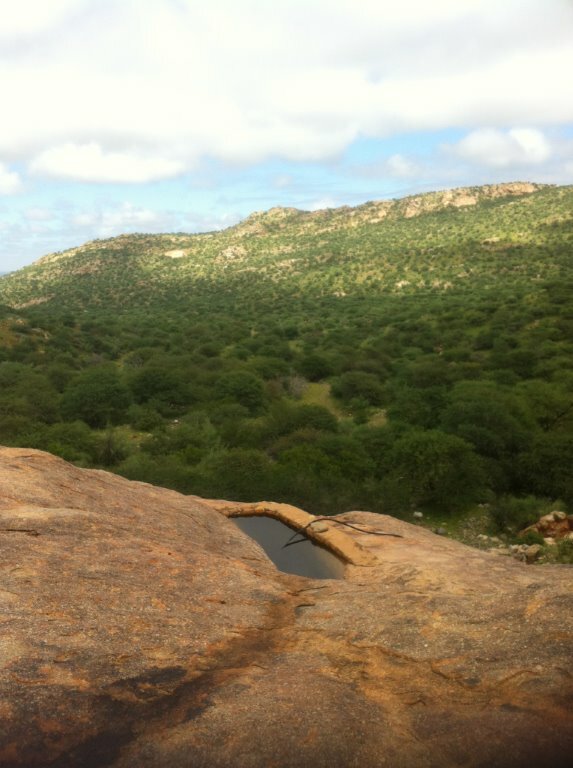 With these new areas we conducted a very good hunt where we spent many hours of excellent walking and tracking. 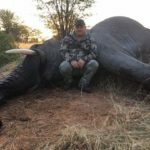 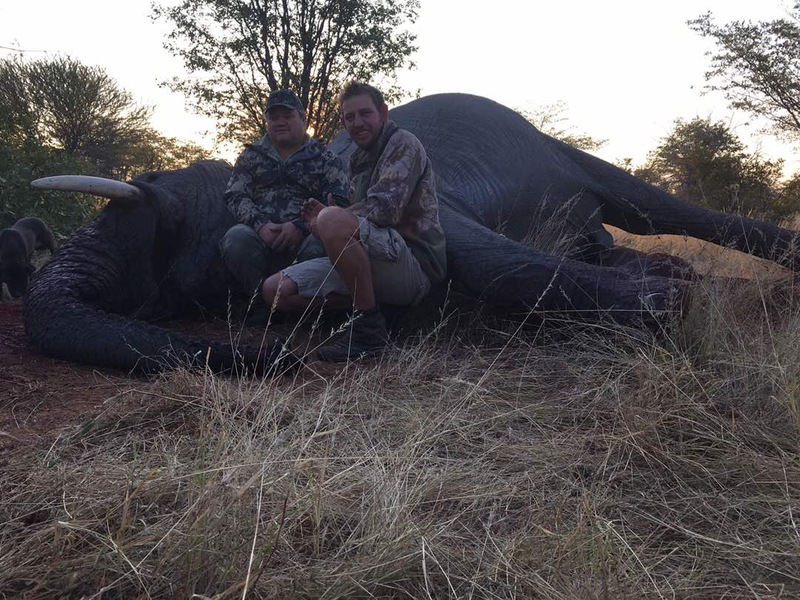 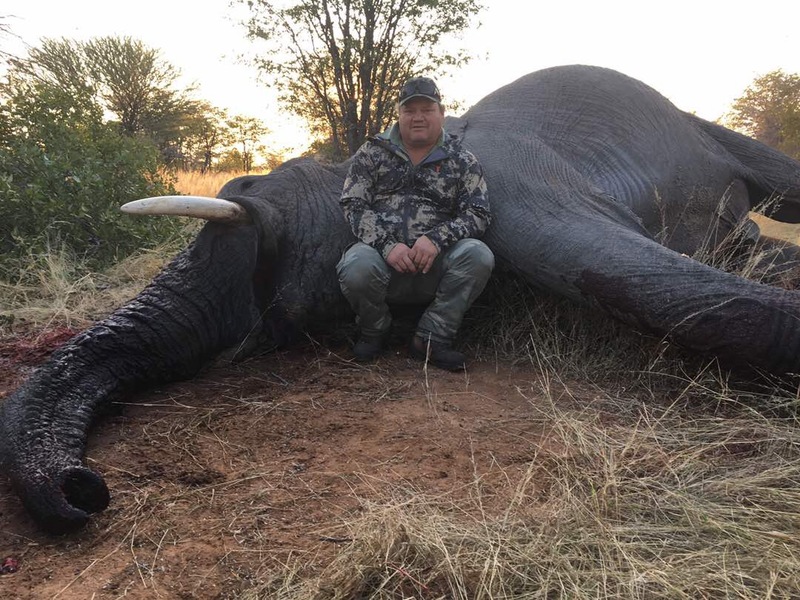 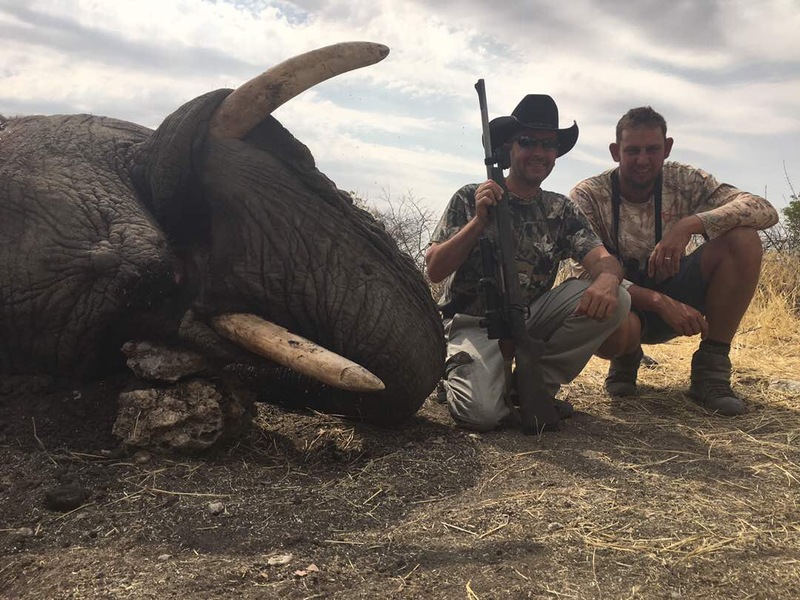 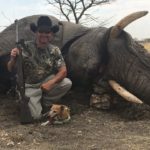 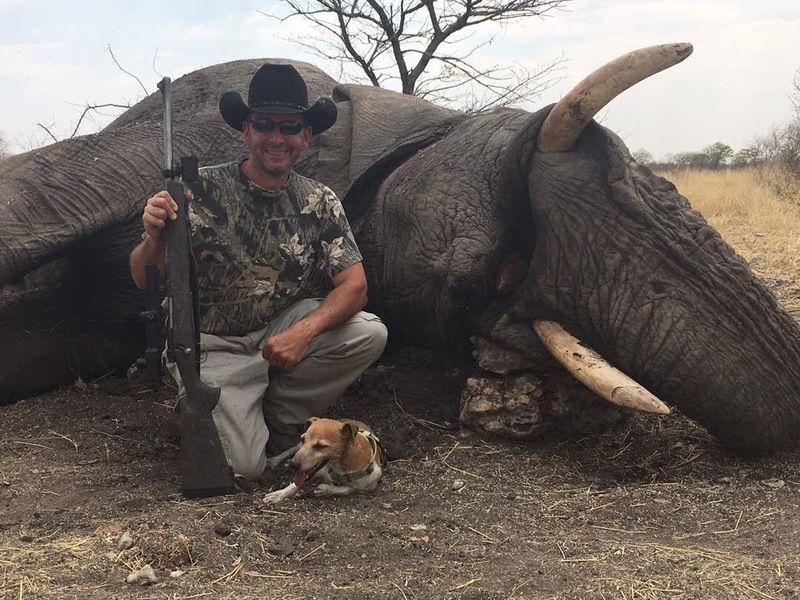 After 10 days of sweat and dust, Michael harvested a magnificent old bull elephant that turned out to be 61 pounds one side and 53 pounds other side. 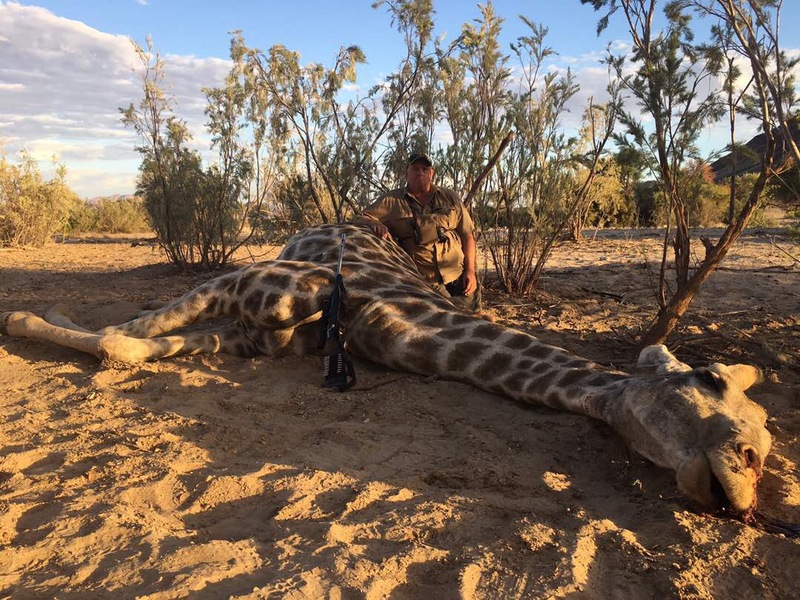 As the year draws to a close with the relentless heat never taking a break, the drought forces us to slow down and a wonderful giraffe hunt is completed in Puros. 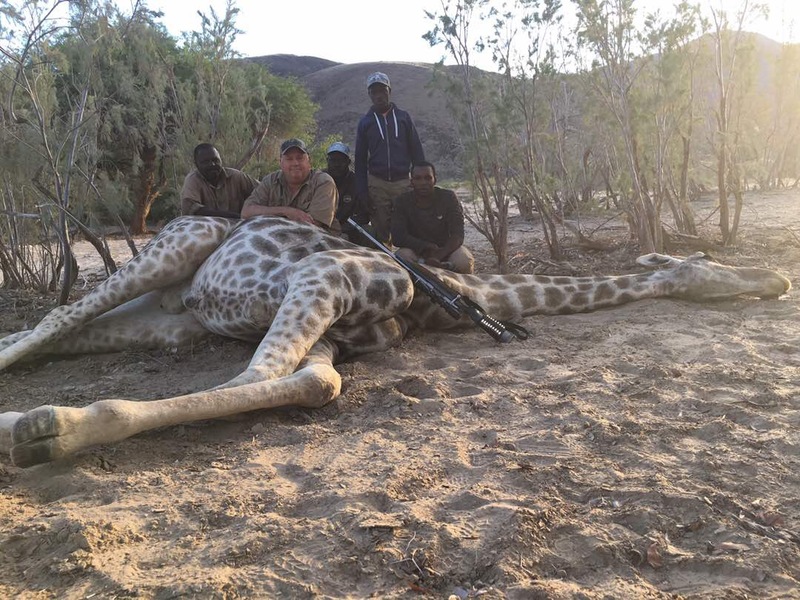 These are totally free roaming Giraffes and we finished this hunt with a Spotted Hyena in my new areas. 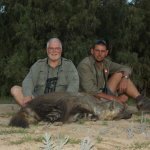 The last hunt of the year was with a very good friend and hunter who came to join me on his hunt of a life time. 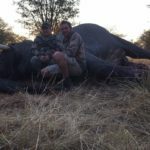 With our persistence we were able to harvest his elephant on day 3 of his safari and we ended the hunt on the tracks of lions, but simply ran out of time to pursue the lions any further. 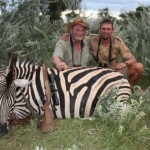 This is a brief summary of the highlights of the past year. 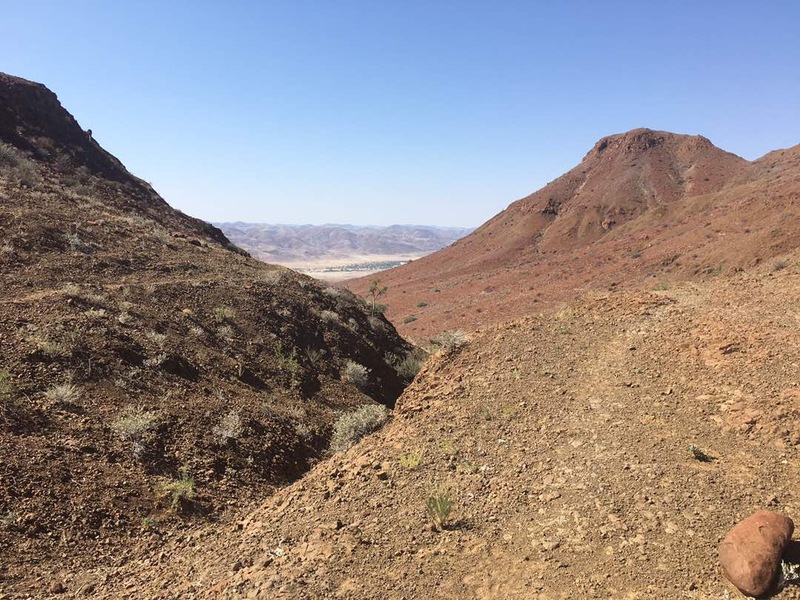 What’s in store for 2016? 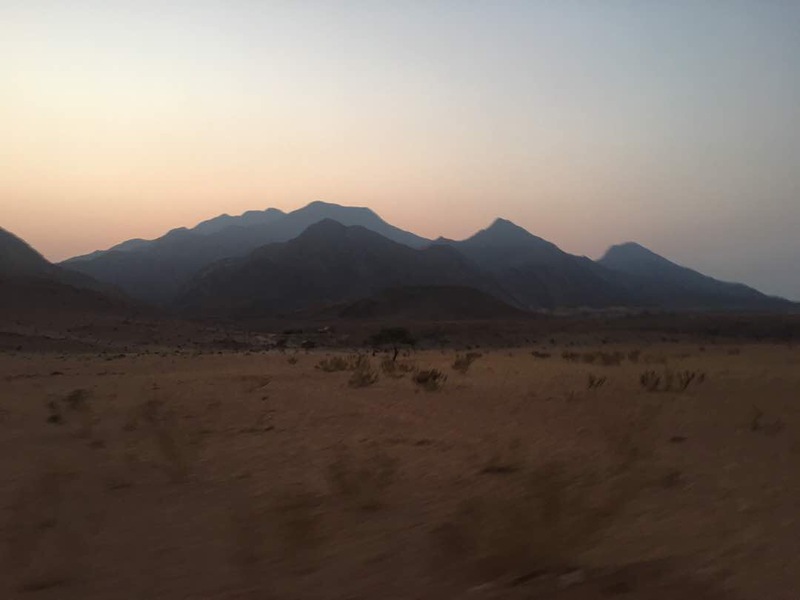 First, I plan to make my North-Western hunting areas larger, more productive and to establish a hunting camp of my own in the area. 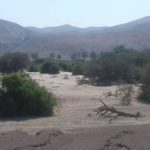 It seems the drought is slowly starting to break and I hope and pray the rain keeps on coming. 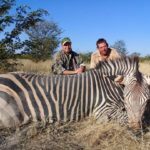 Second, another area I plan to expand and make a bigger part of my Safari Company in the coming year will be conducting bird hunts. 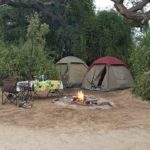 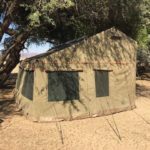 Bird hunts will be done over most of Northern and North-Western Namibia with luxury tented camps and good accommodations. 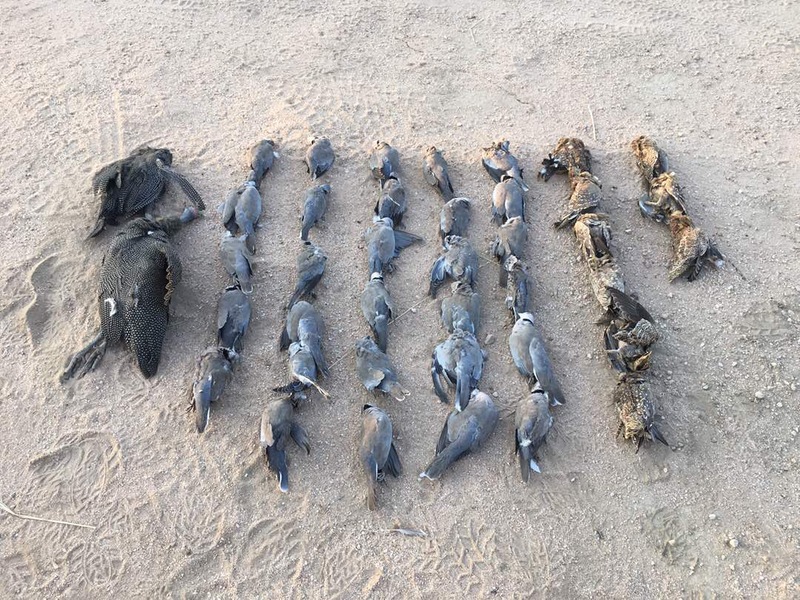 Hunts will consist of a morning shoot, then some driven hunts in the middle of the day and an evening shoot where hundreds of Sand Grouse and doves come to the water holes. 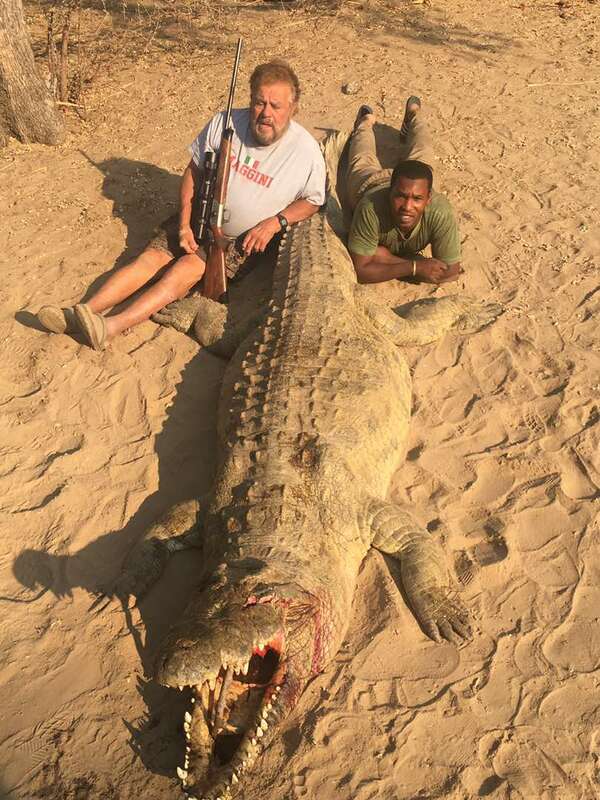 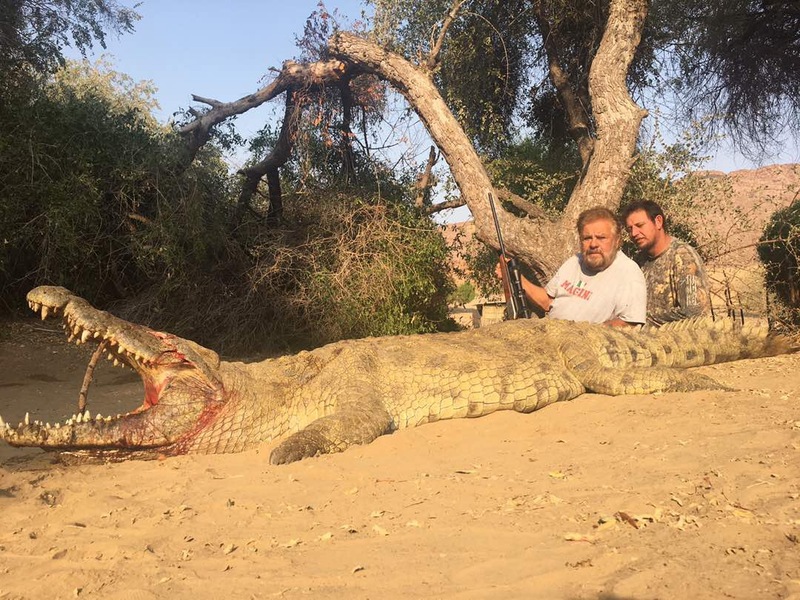 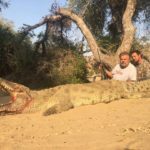 Still available for big game in the coming year is an Elephant and/or Crocodile hunt in the Kunene River Concession. 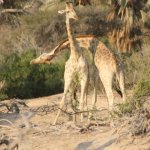 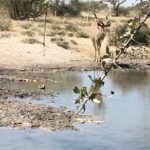 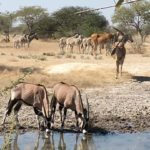 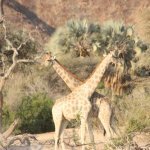 There are still many opportunities left for Plains Game Safaris in the various concessions of North-Western and Northern Namibia where the clients may custom tailor a safari of their dreams. 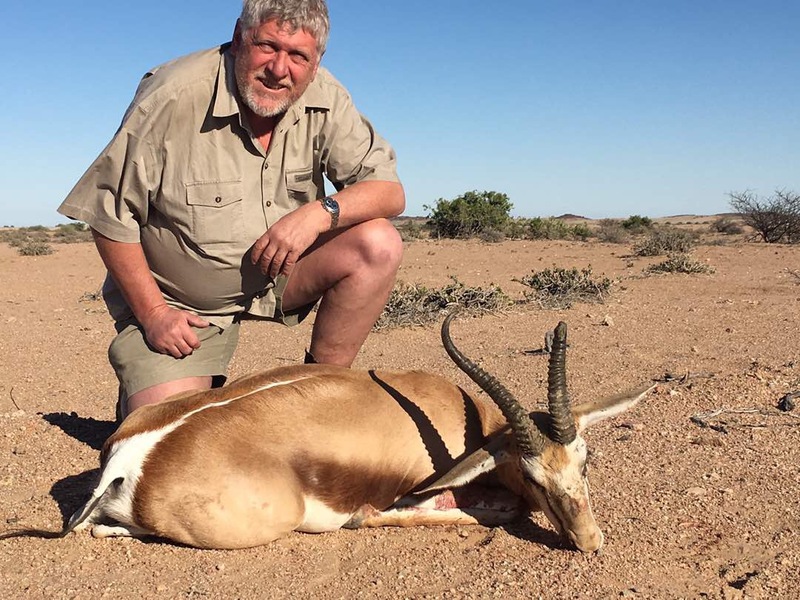 When I am back out hunting, my wife Ronel is doing the office work, as most of you have noticed by now. 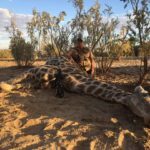 My kids grow bigger; Arizhia will go to school next year and Geremy is growing up very fast and wants to come along hunting every time I go out. 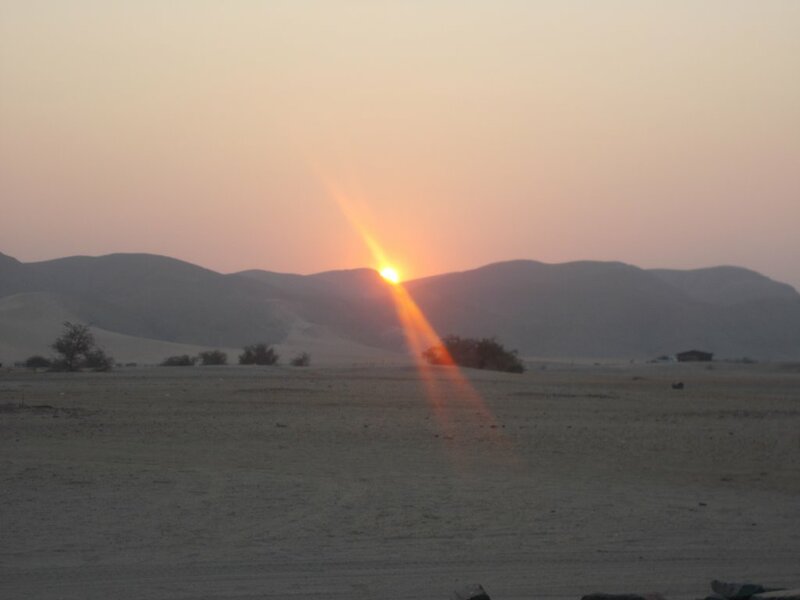 I want to wish you all a very Merry Christmas and all the best for 2016. 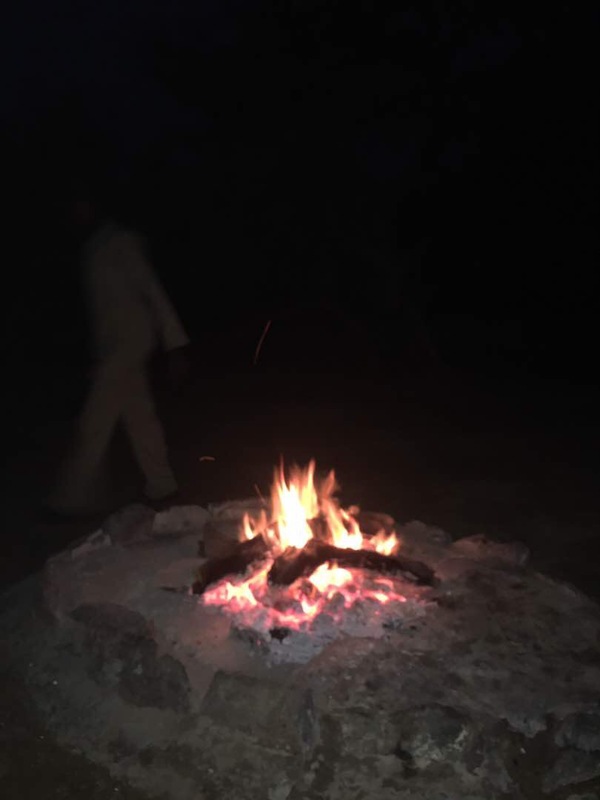 May we see one another in “Wild Africa”, where the sun sets beautifully and the camp fires make us forget all problems. 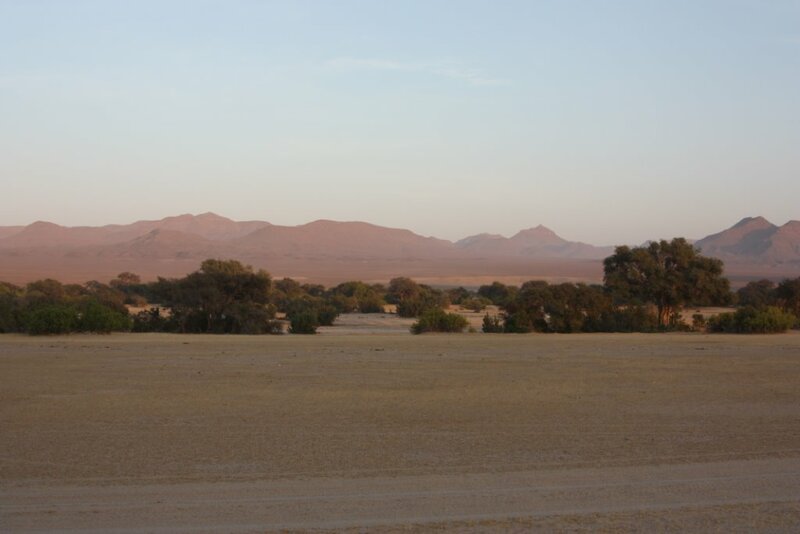 A light western wind blows over the desert plain. 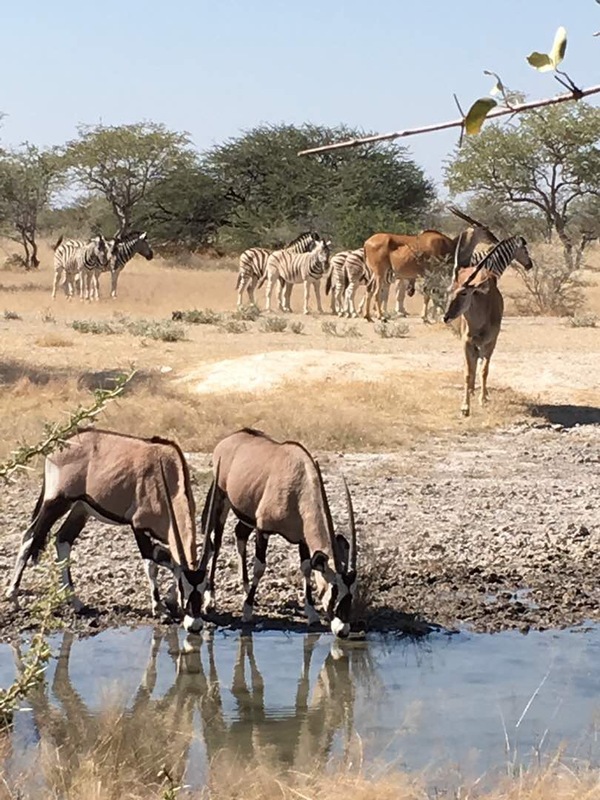 It’s dry season and the dust picks up as a herd of Zebras walk over the plain. 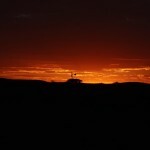 The sun is setting slowly and turns the sky from blue to reddish yellow and that slowly gives way to a red glow. 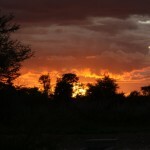 As I look over the African plains and appreciate the sunset in front of me, I know the year is also coming to its end. 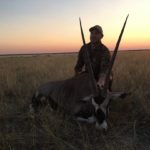 With the reflection on my mind of the great hunting days that have passed, I know that tomorrow will be a new day to guide some of my clients, that are by now friends, to the game they seek. 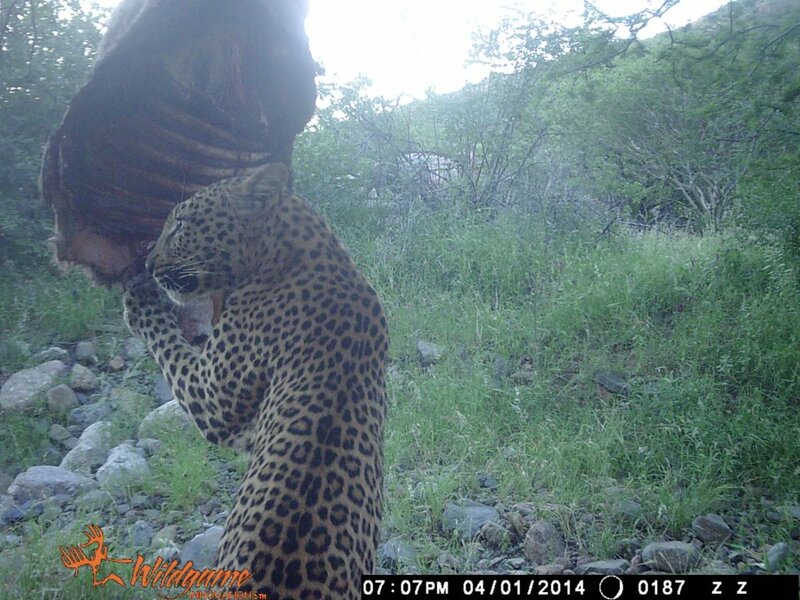 As it gets dark, I start looking back over this year and some great hunting for 2014. 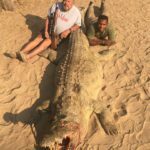 Though it is impossible to put every detail on paper, this story is some of those trips I would like to remember. 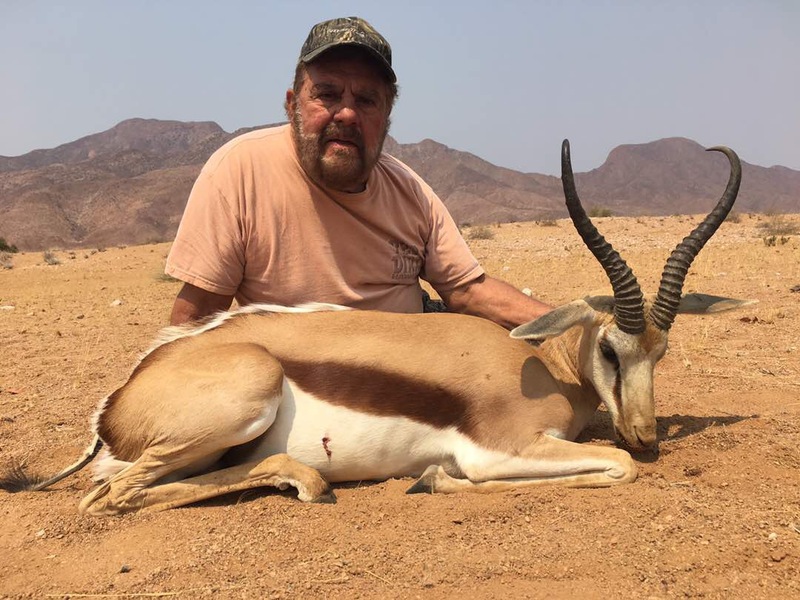 All are good, but maybe because of a special animal that was hunted, but also for the good times that was shared in the hunting camp and around the camp fire. 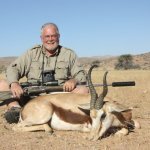 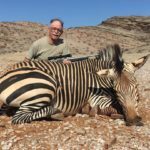 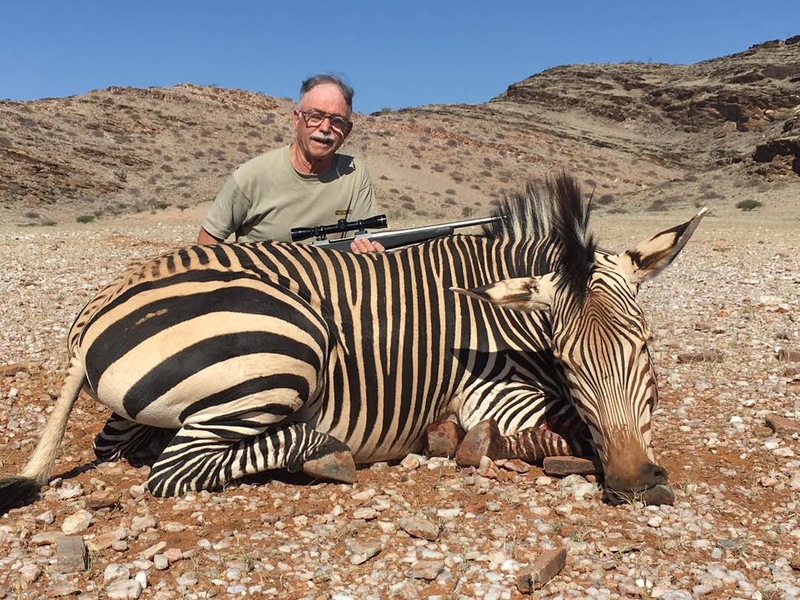 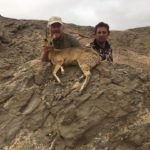 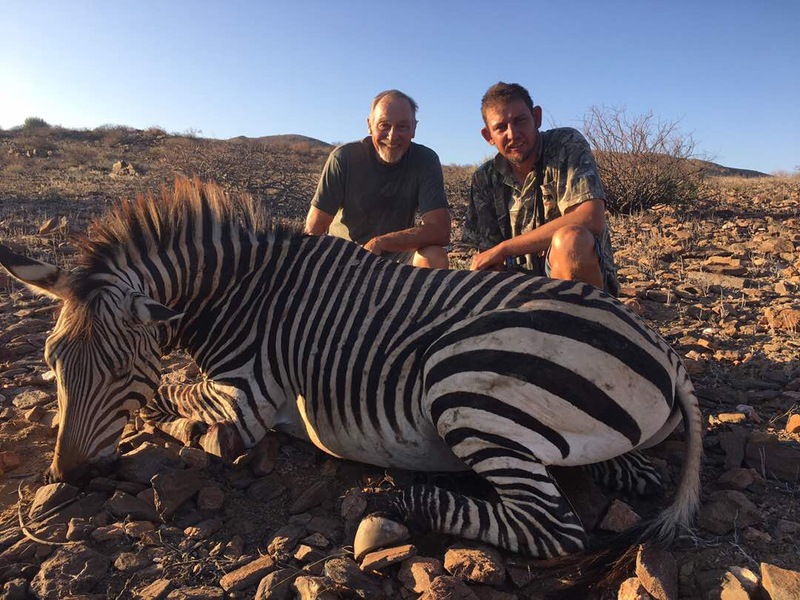 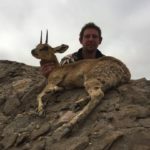 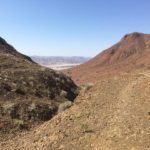 With a good rainy season that came between end of March and in April, I went up to the Erongo Mountain to do some really great hunting, from Mountain Zebra in the rain to Blue Wildebeest on a day that we thought we would not find anything, to the biggest Leopards that had taken our bait. 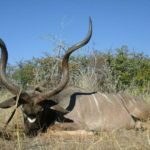 As the rainy season stopped and the grass turned to yellow, it was breeding season for Kudu, Waterbuck and Impala. 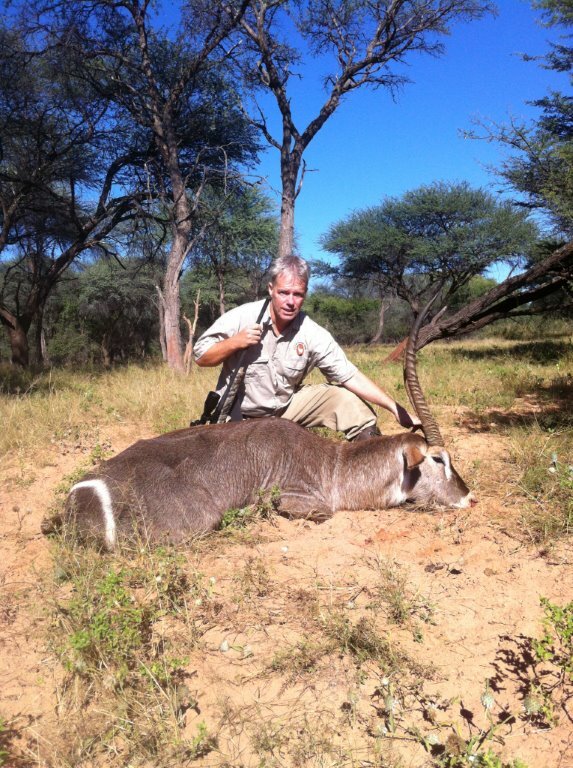 The Rut is a wonderfultime to find the big Bulls and Big Rams. 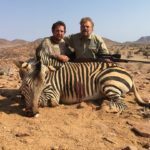 With this happening, an old friend joined me for a short but great trophy hunt. 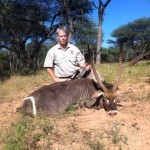 Andrea harvested a nice big Waterbuck along with gold medal Impala and a magnificent Letchwe to end his trip. 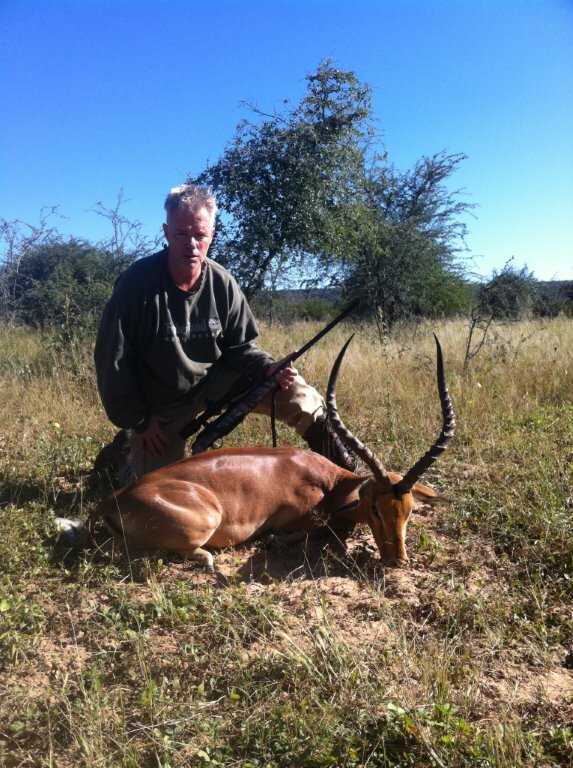 His friend Peter was not left out of the action taking himself a nice Kudu and Impala. 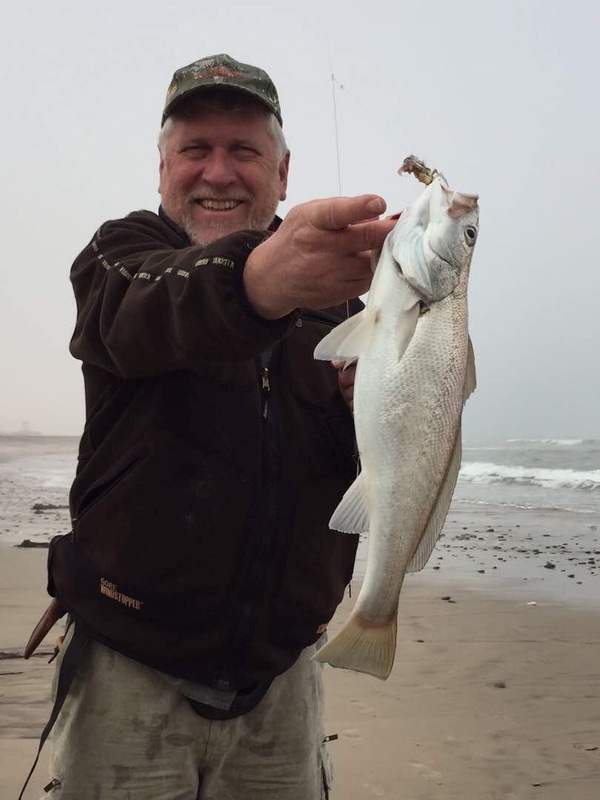 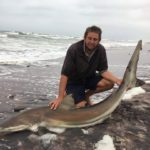 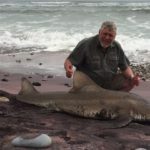 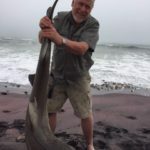 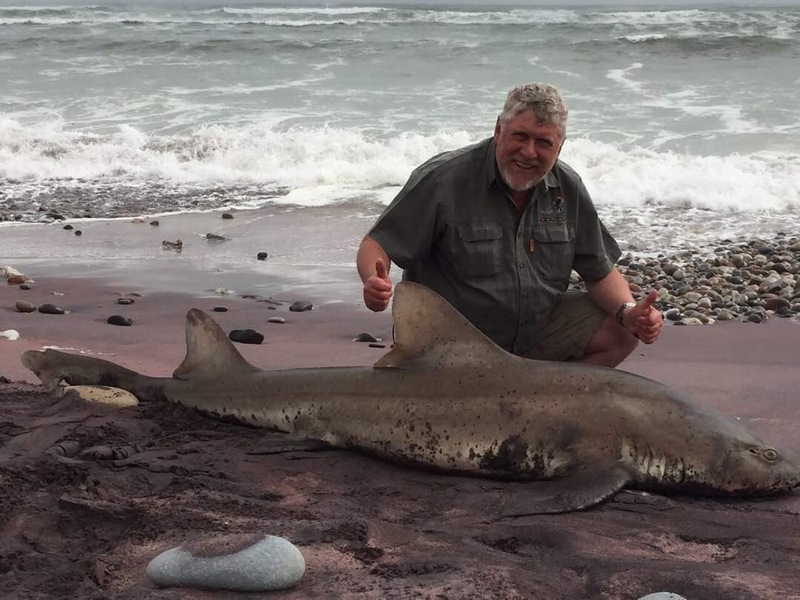 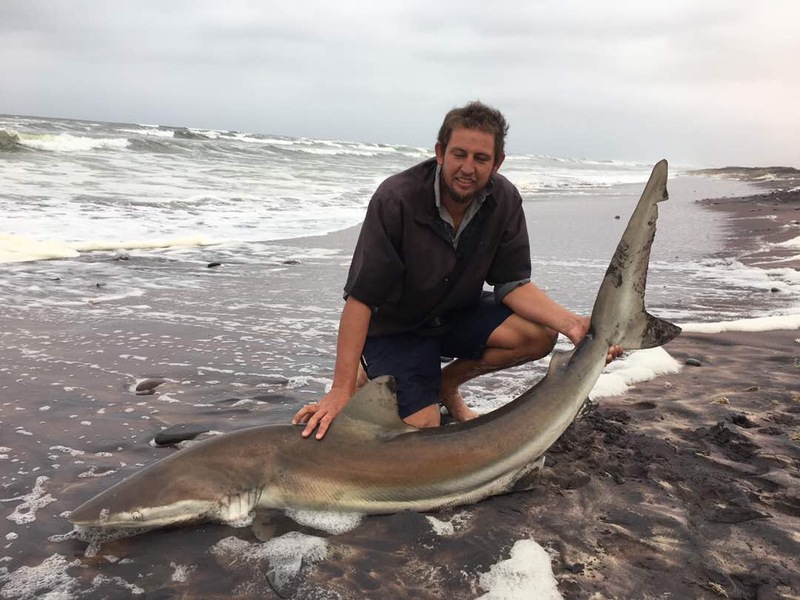 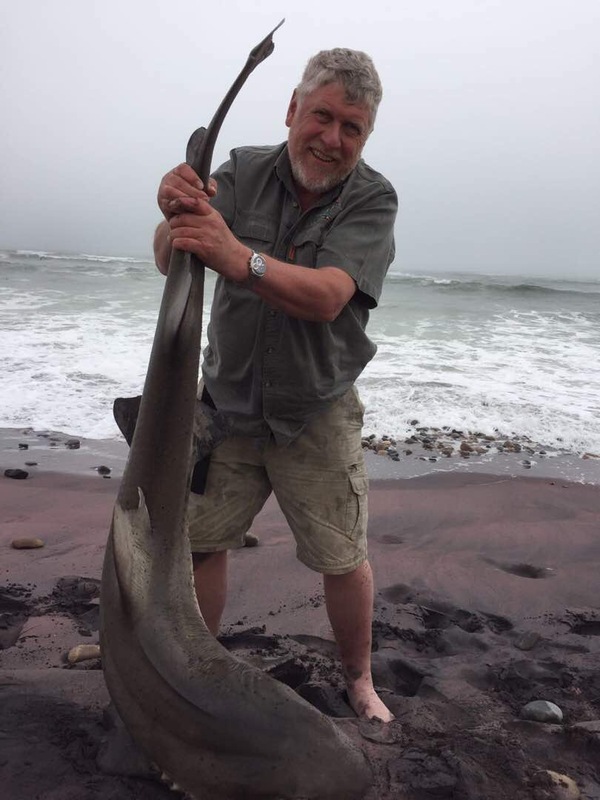 The trip was ended with some good shark fishing on the beach of Swakmund. 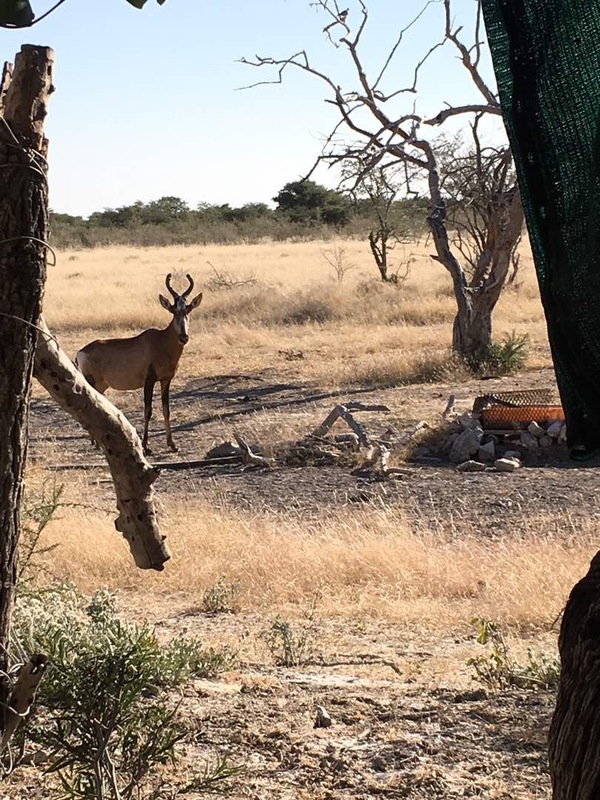 As the year moved on, the hunts have moved also; it was time to start to go west and stay west. 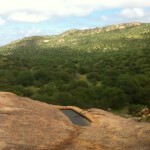 My new hunting area, Puros. 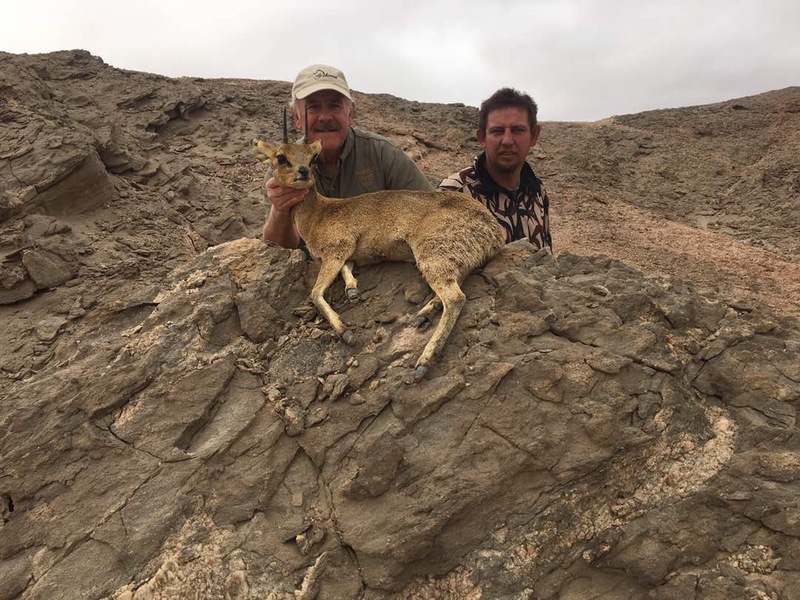 It had seen little hunting activities before, but now it was time to give it the real test. 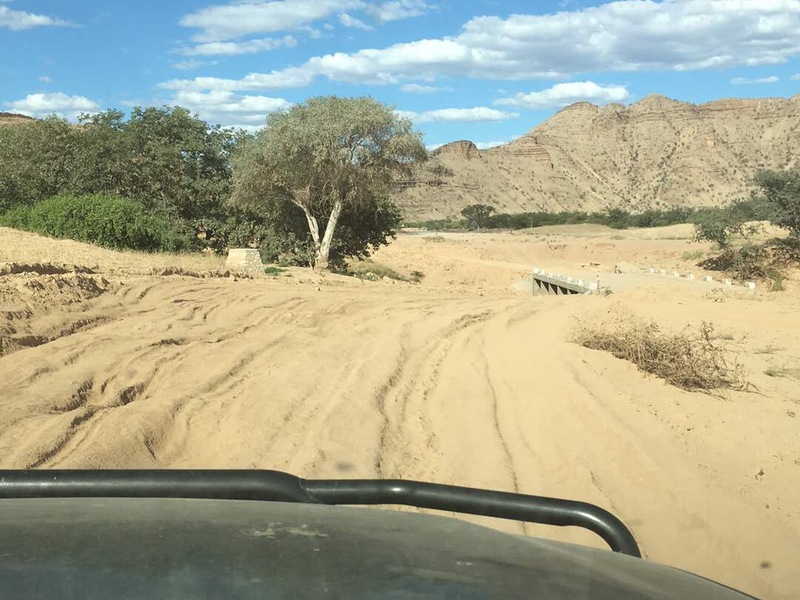 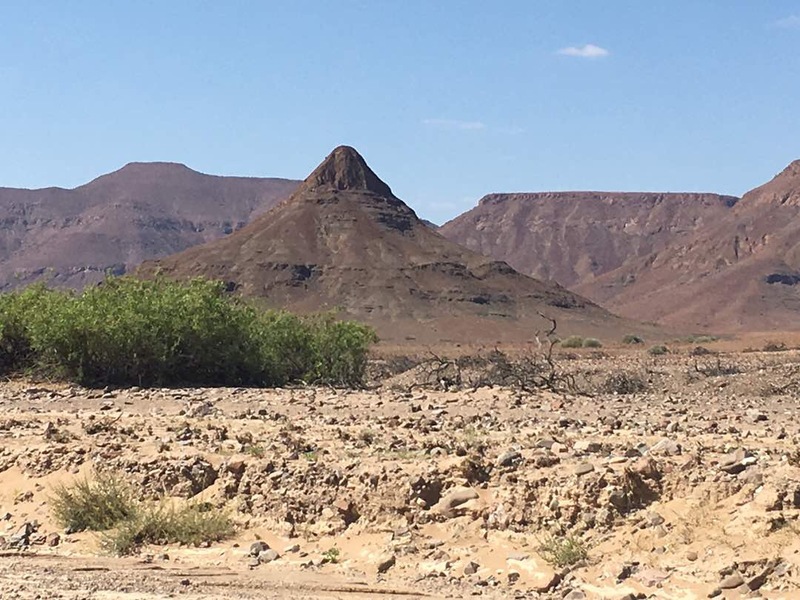 With a fly camp on board and two hunters with us, we took the long road, and arrived after some long but really good 4×4 driving through some of the most beautiful landscapes Namibia has to offer. 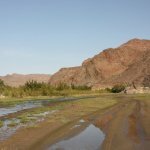 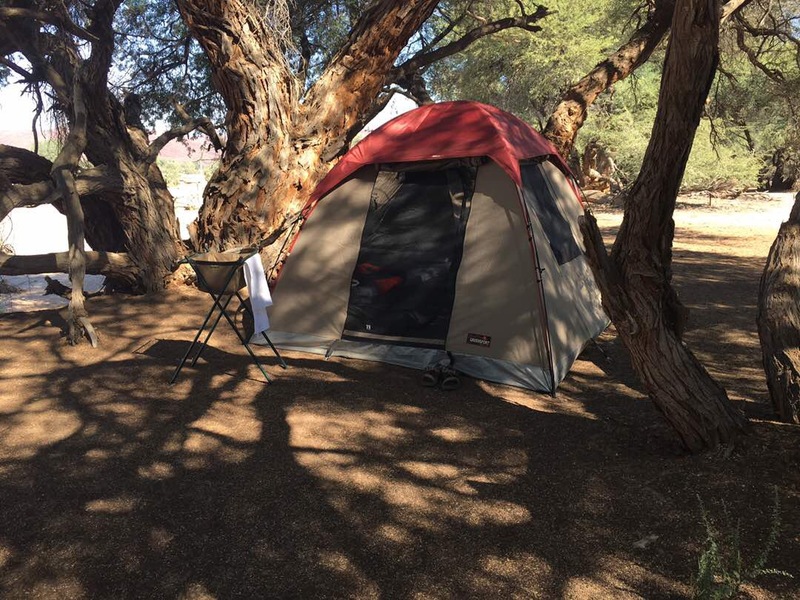 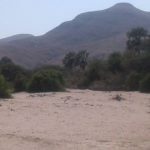 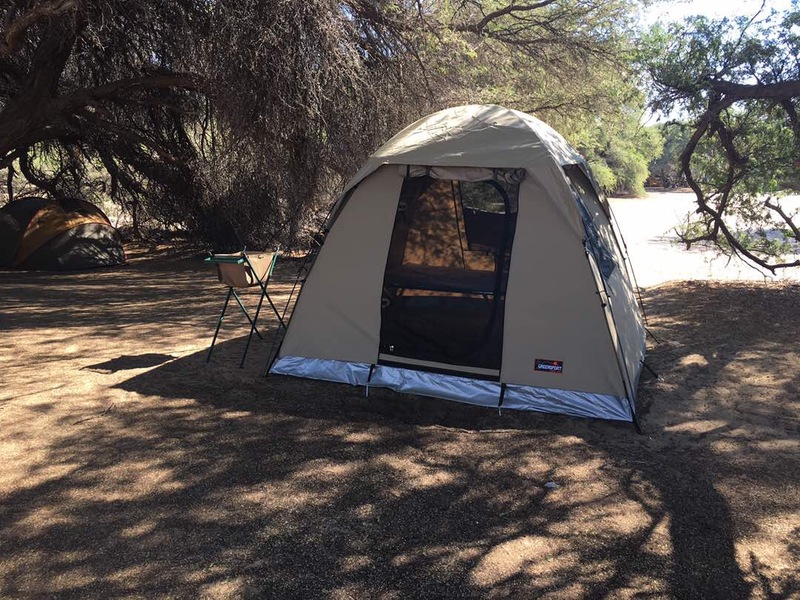 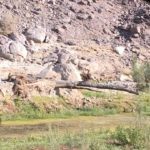 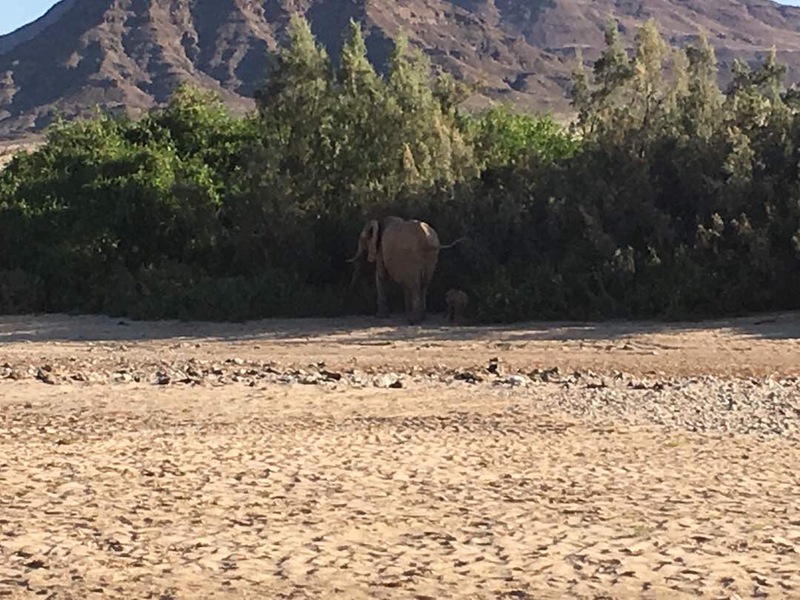 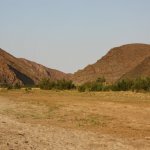 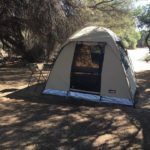 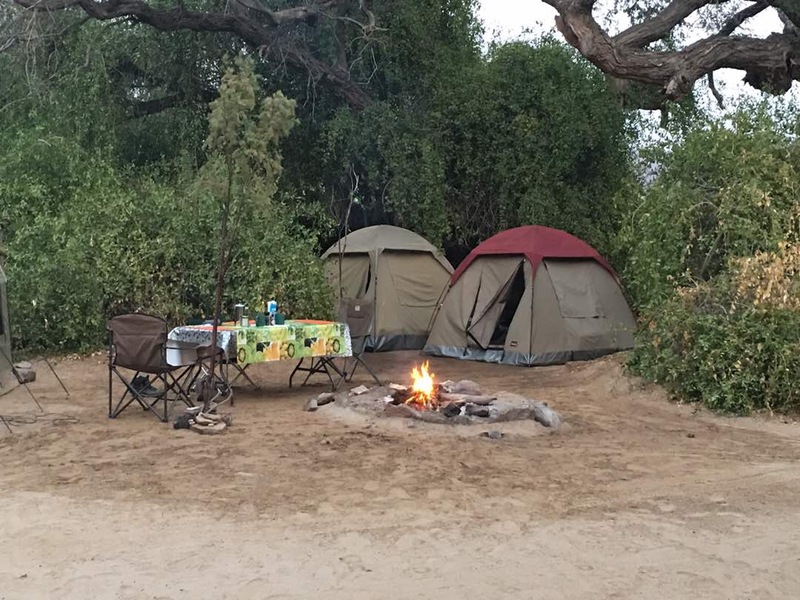 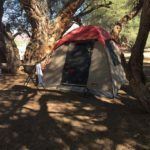 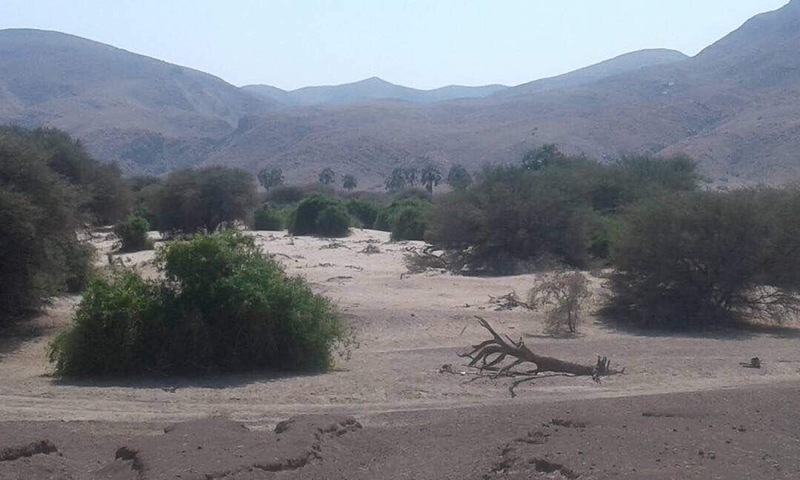 We set up camp in a river bed between great old thorn trees that lay between mountains. 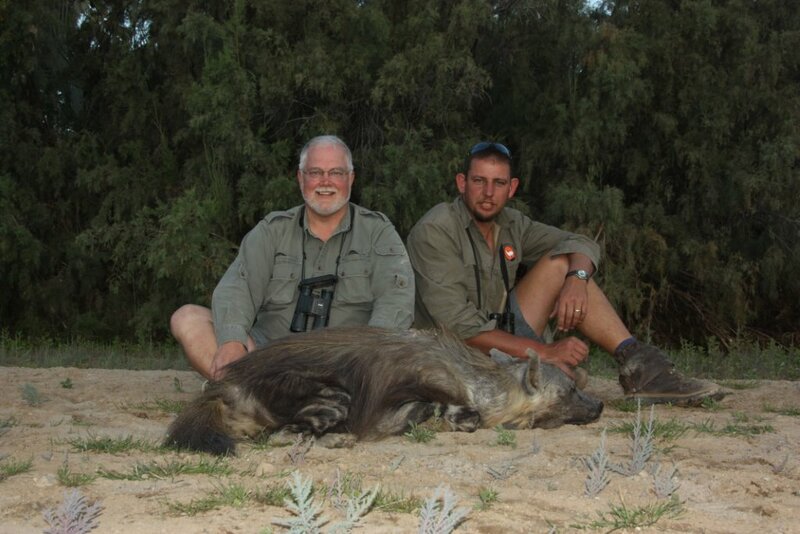 On this hunt there was no holding back, as Richard and Lance had a lot of hunting to do. 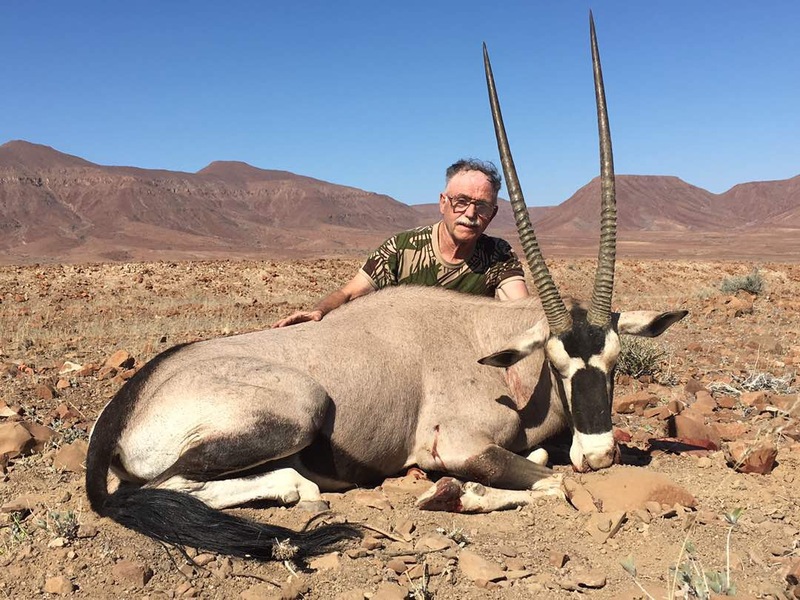 Richard opened the hunting and made history again. 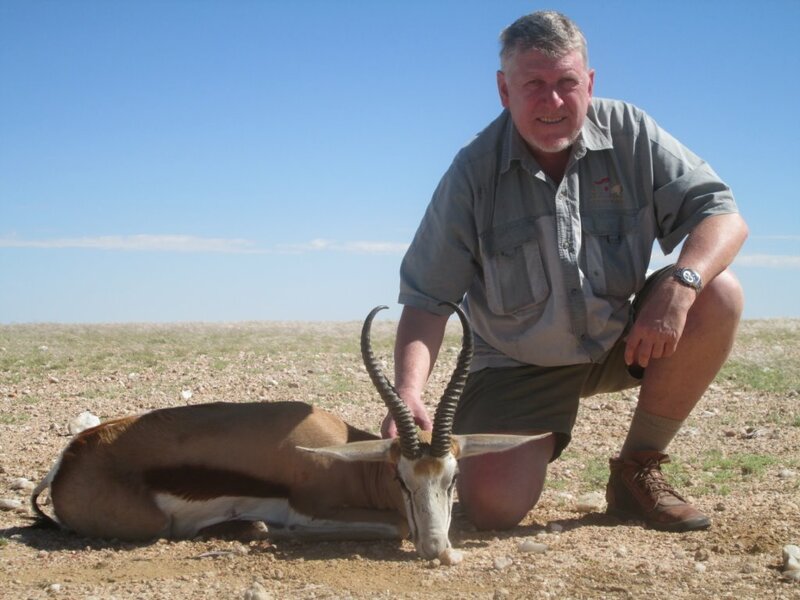 Just last year he became the first hunter to take a Blackface Impala Free Roaming in over 40 years. 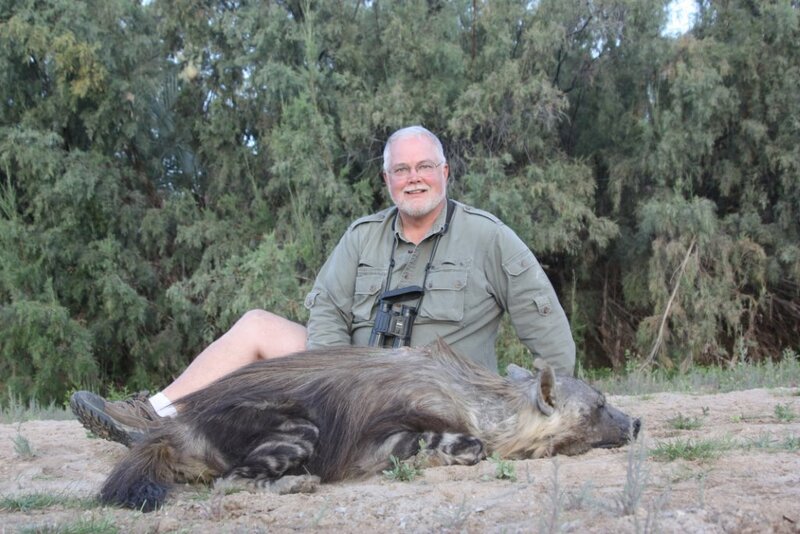 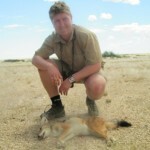 This year he became also the first hunter to shoot a Brown Hyena in the conservancy when it was opened. 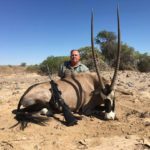 We started with some good hunting but it just got better. 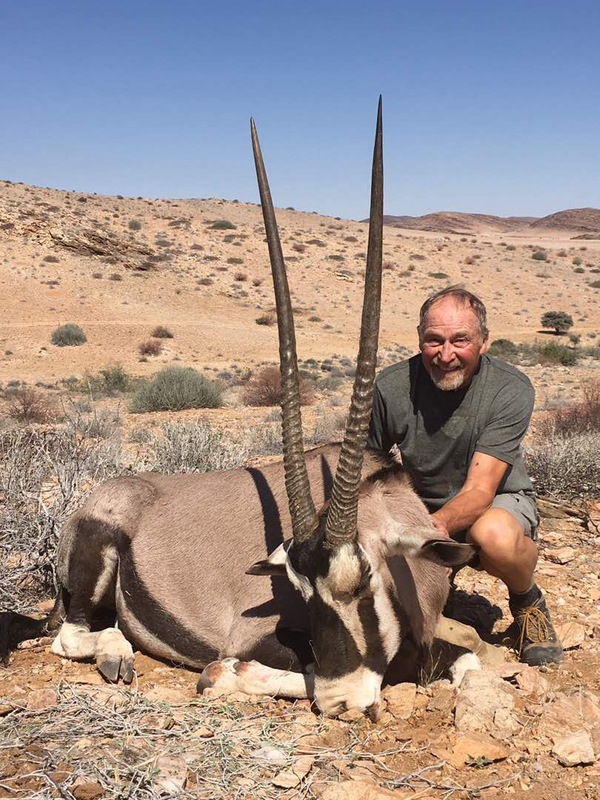 Four Springbuck were shot around the 16 inch mark, some great Oryx and Kudu with a Mountain Zebra. 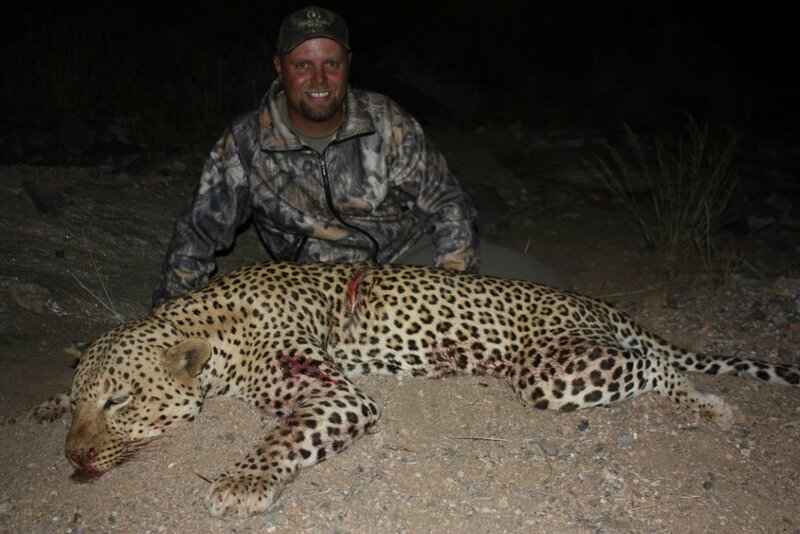 Lance added one beautiful old Leopard male to end the great time on the Great Plains off the west. 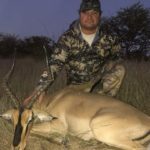 As I got back there was some more plains game hunts to do and then it was time for me to go and test my skills in South Africa. 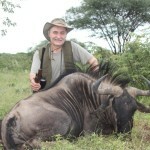 Three old friends arrived on a charter flight and we were in the area. 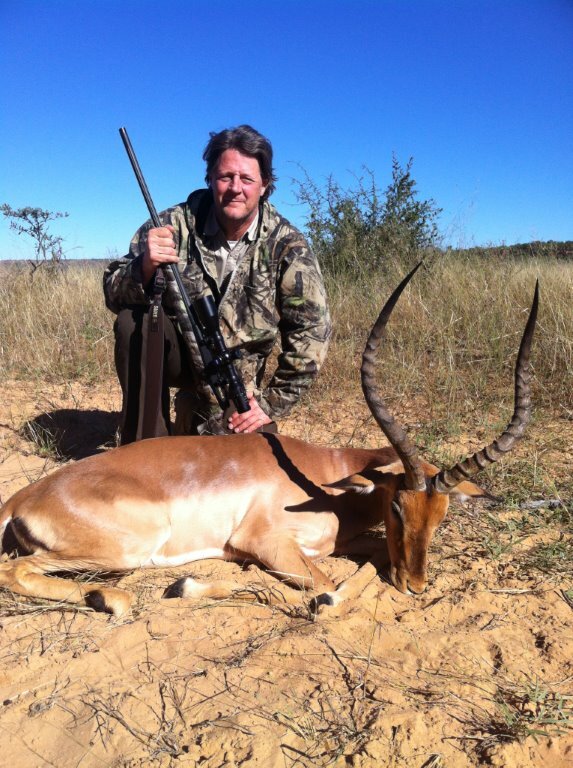 As lucky strike, we got a lion that tried to sneak into Botswana after being at a big game ranch but he was spotted. 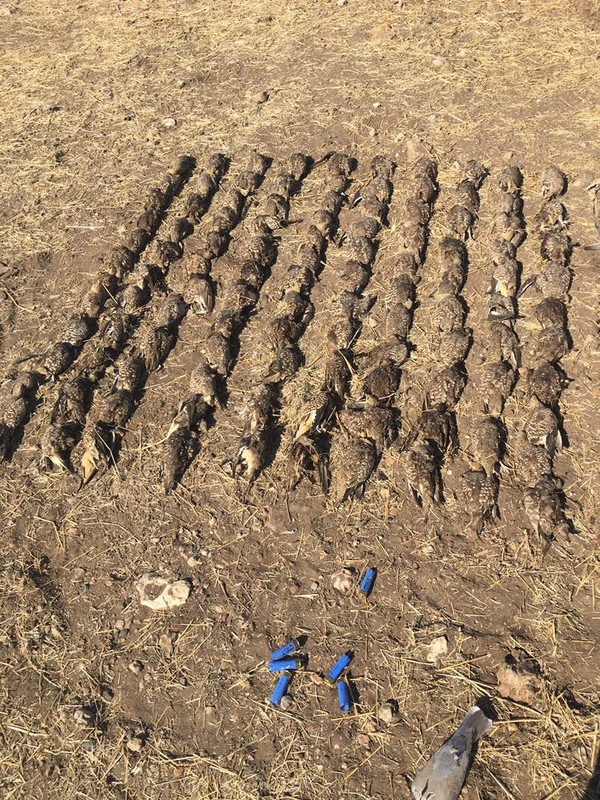 So it was one of the best first day hunts that you could have. 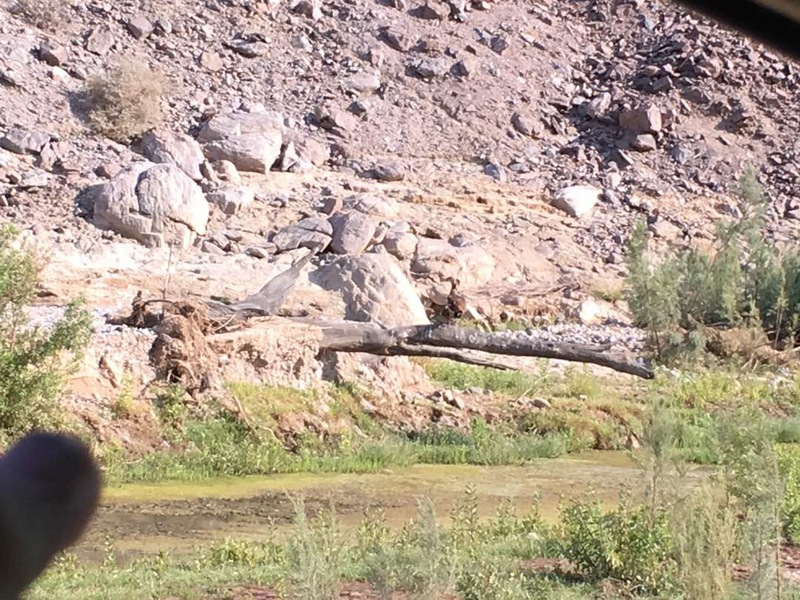 By late in the afternoon we snuck up on an old lion male laying and resting under a bush. 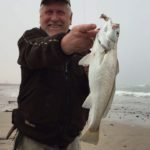 With some fine shooting it was in the salt. 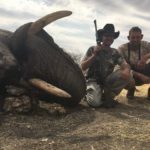 On this hunt two more buffalos were added to the list before it was time to get home again for the hunters and time for me to head into my next adventure. 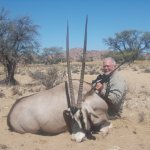 For next year 2015, my previous hunting areas will stay as is, but one more western area, ‘conservancy ‘ will be added next to the Kunene River for great big Crocodile, that includes good Leopard area and some of the best Springbuck and Oryx. 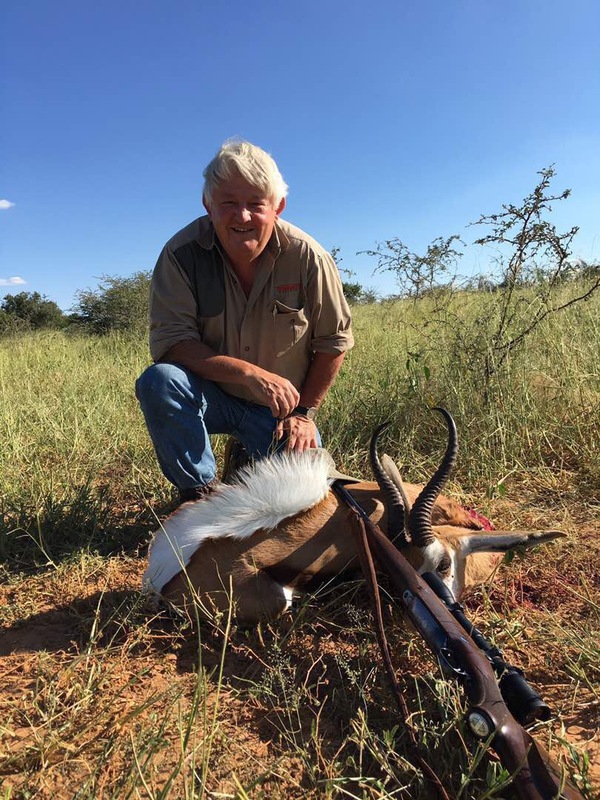 The hunts in South Africa will become standard procedure. 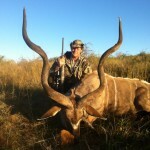 The area against the Kruger Park will become the place where most buffalo hunts are to be done. 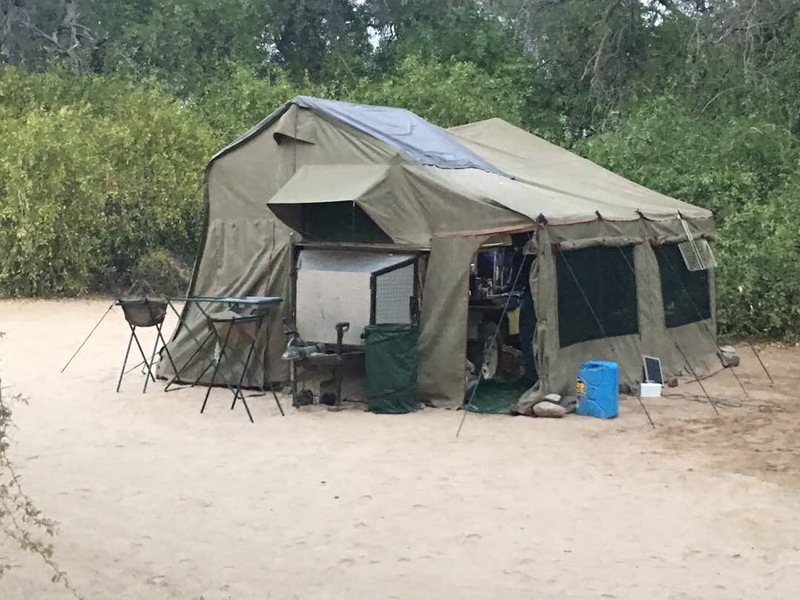 As you all know, I moved over a year ago to Swakopmund now, and my family have never looked back and keep enjoying every day. 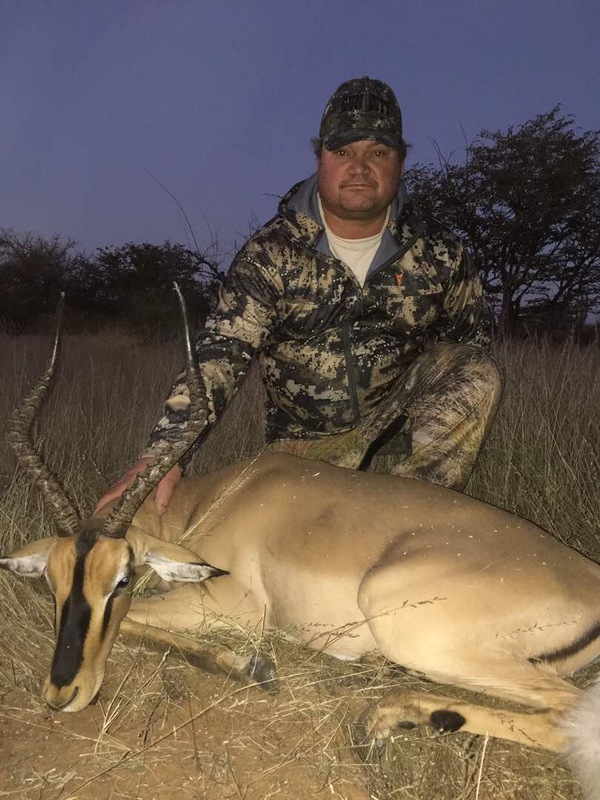 My wife Ronel, as a lot of you have notice, has taken over the office work to give me more free time in getting everything set up for my hunts and make the work easier on me. 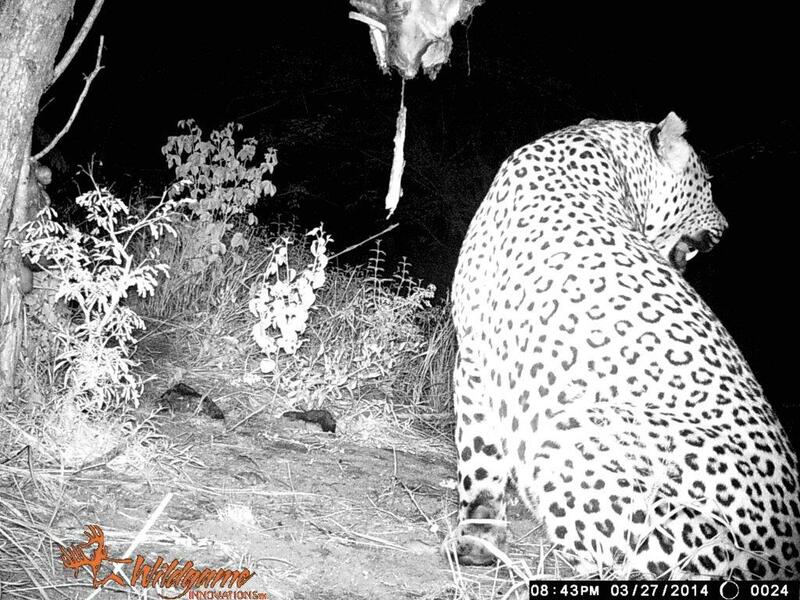 Arizhia is getting bigger by the day and it will not be long before she will be out there to try her luck on some hunting. 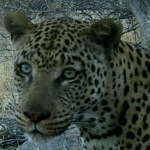 Geremy will follow his sister at a much younger age, but soon, he too, will get something right. 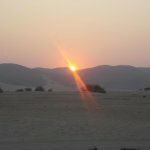 With this I want to wish you a nice couple of days toward the end of the year. 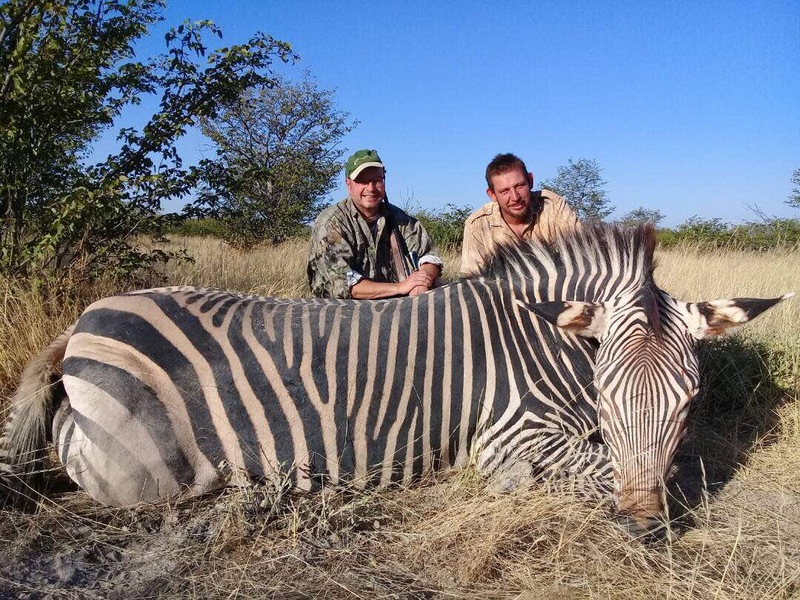 Pricelist and specials for next year 2015 will be out soon, those that still think about a trip, please do not hesitate in contacting me, as I will be gladly assisting and happy to give everybody the hunt of a live time. 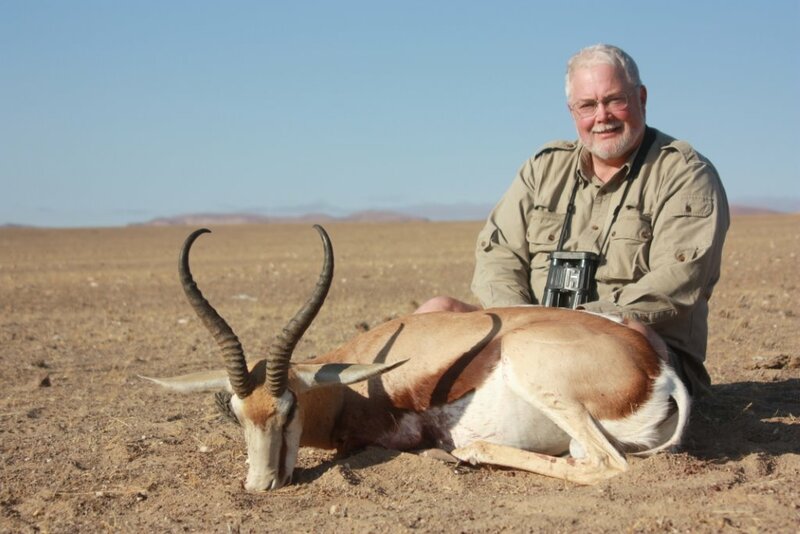 Happy hunting and may the winds stay true to you. 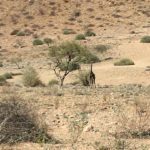 Hare some photos, mostly from Puros Conservancy, in Namibia, Africa. 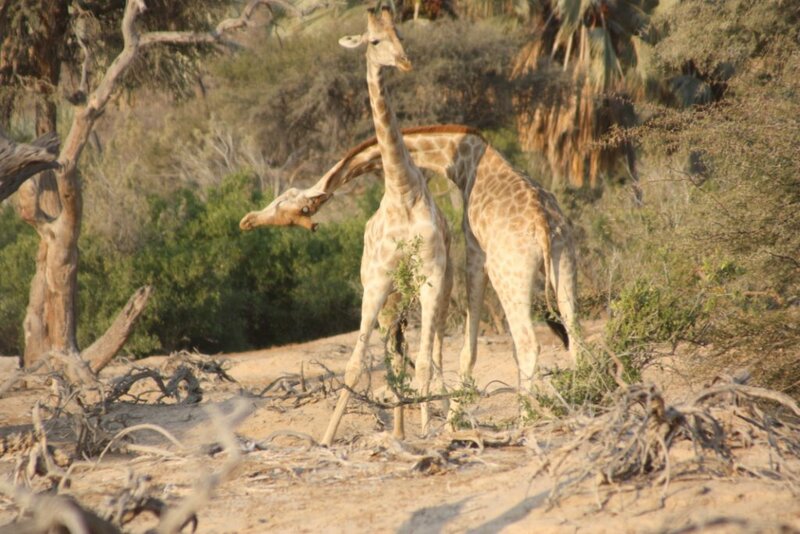 Click each picture to view it larger, then use your “back” button to return to the gallery. 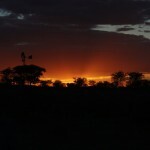 Sunrise in Puros Conservancy, Namibia. 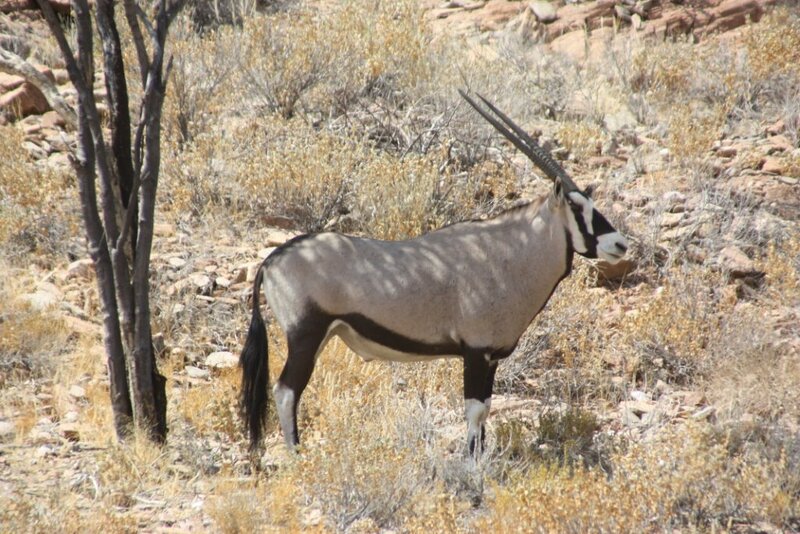 Oryx female from Puros, Namibia. 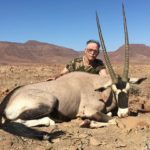 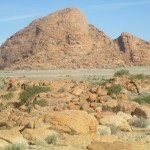 This is the place for big oryx and springbok. 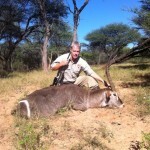 Nice kudu bull hunted on safari in Puros Conservancy, Namibia, Africa. 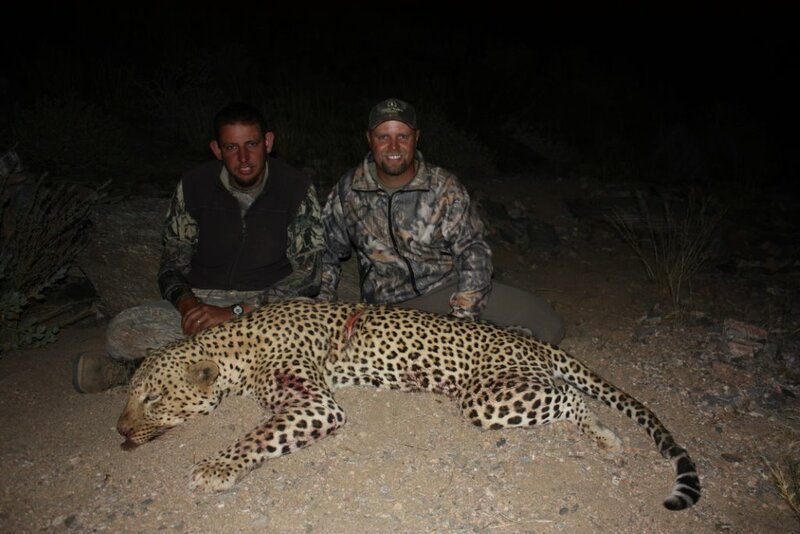 Big male leopard from Puros hunt. 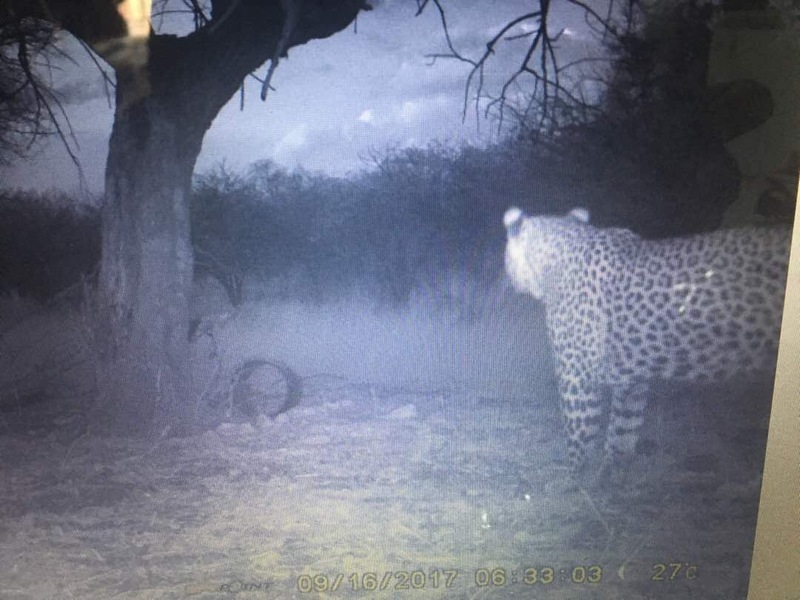 Note the mark on his back from another leopard. 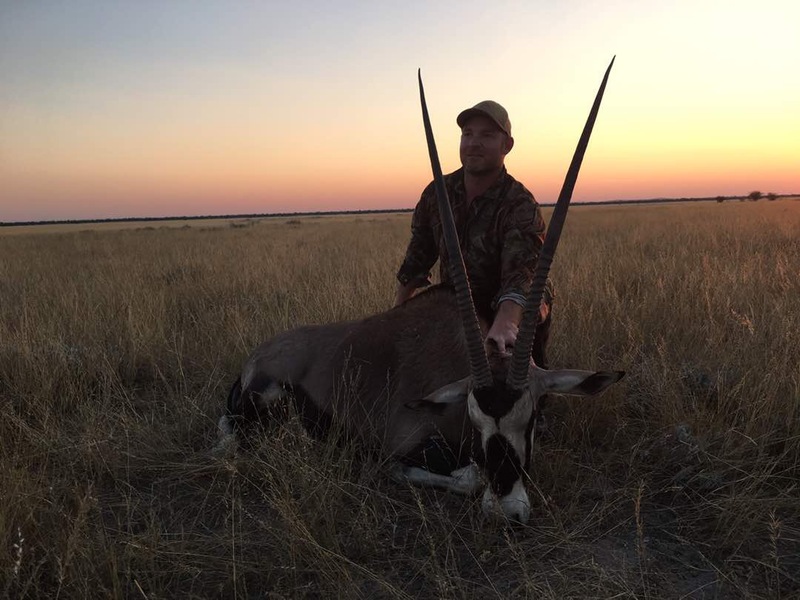 16 inch springbuck from the open plains of Puros conservancy. 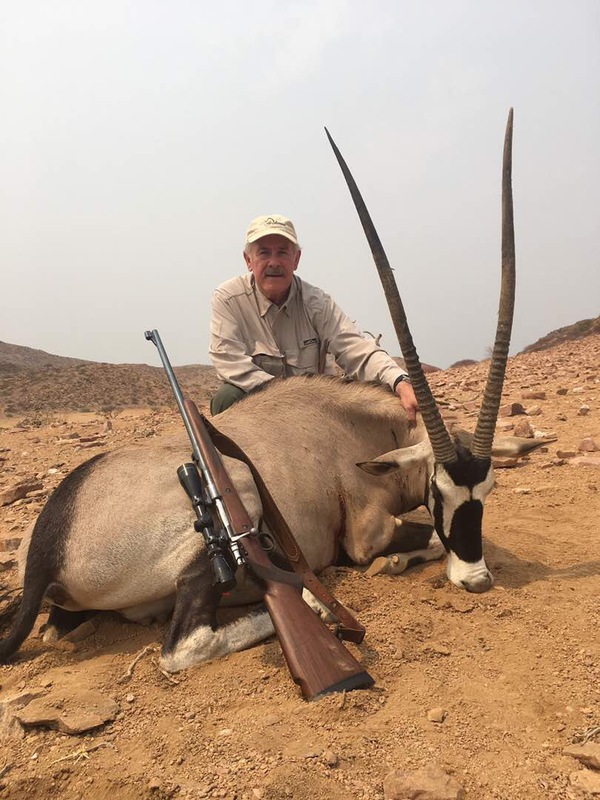 Namibia hunting safari. 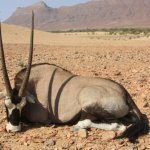 Oryx against one of the many mountains in Puros Conservancy, Namibia. 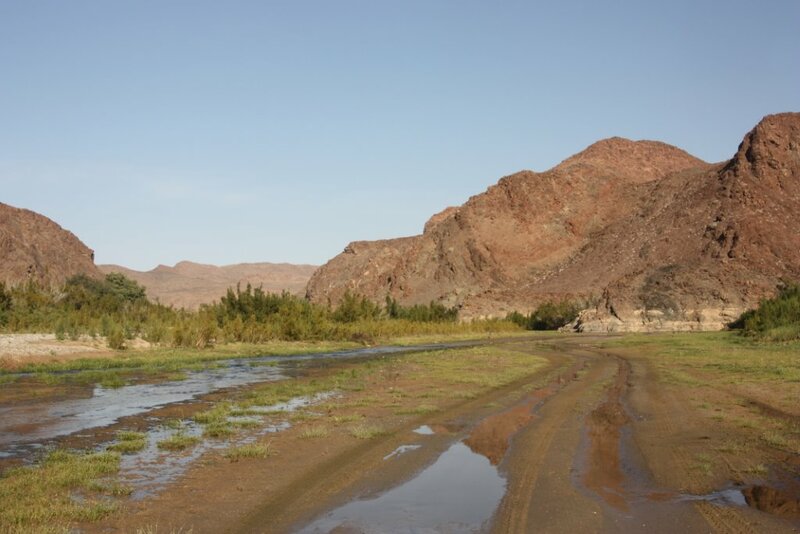 River bed going into the mountains. 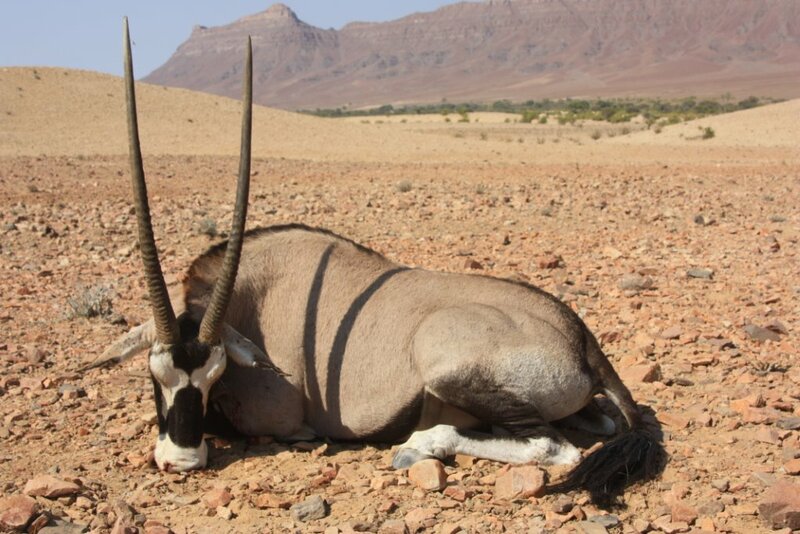 Oryx male from Puros Conservancy, Namibia, Africa. 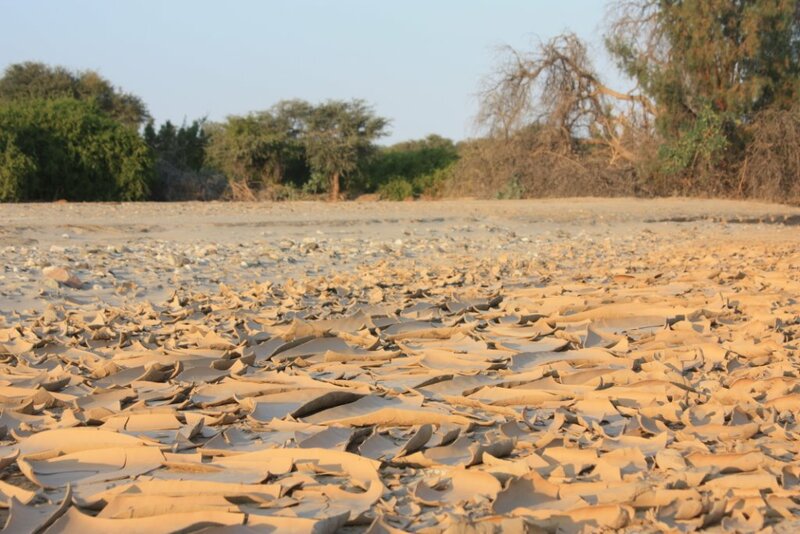 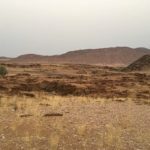 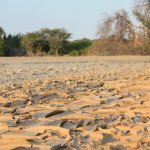 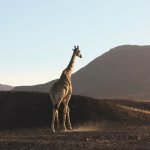 It stayed dry this year in Namibia, Africa. 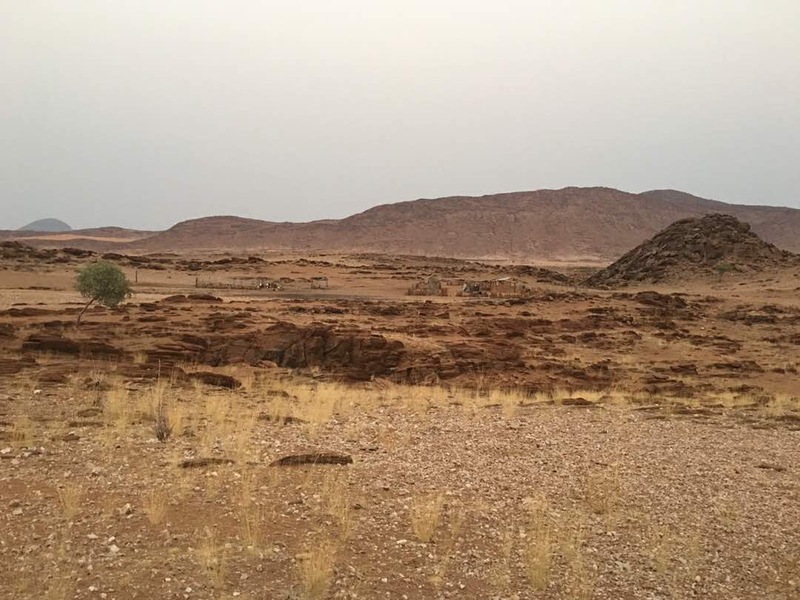 River bed with open plains at the sides. 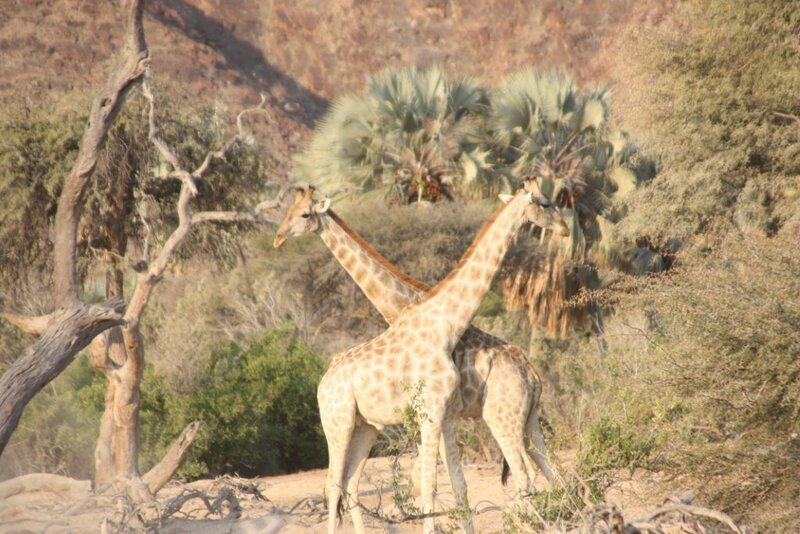 Puros Conservancy, Namibia. 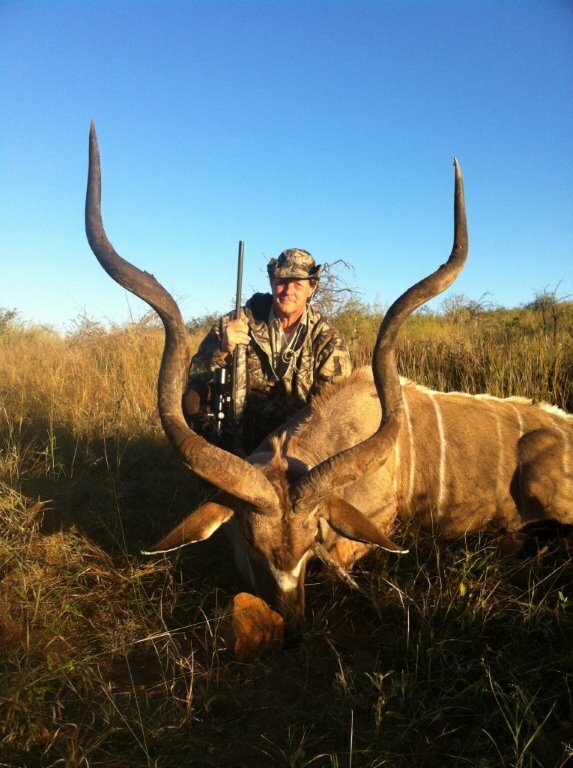 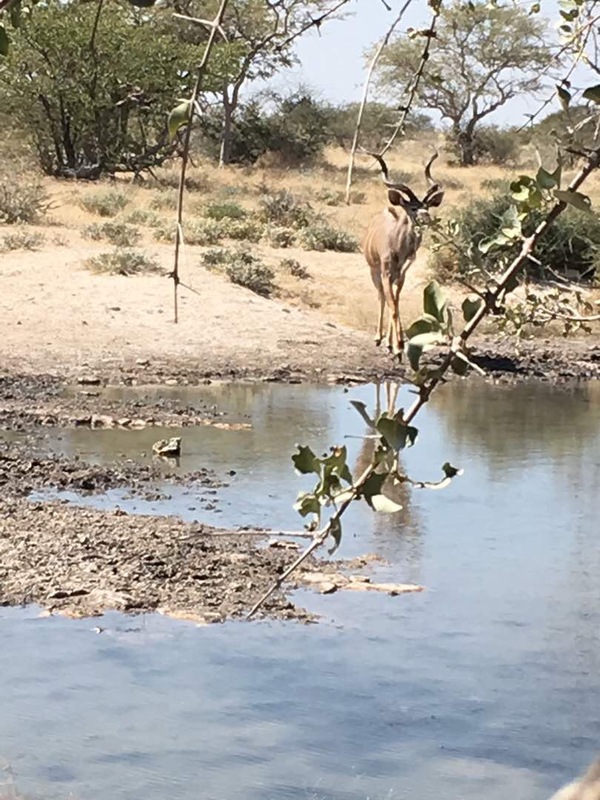 Nice kudu bull hunted in Puros Conservancy, Namibia, Africa. 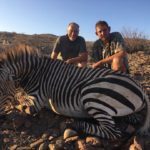 Mountain Zebra. 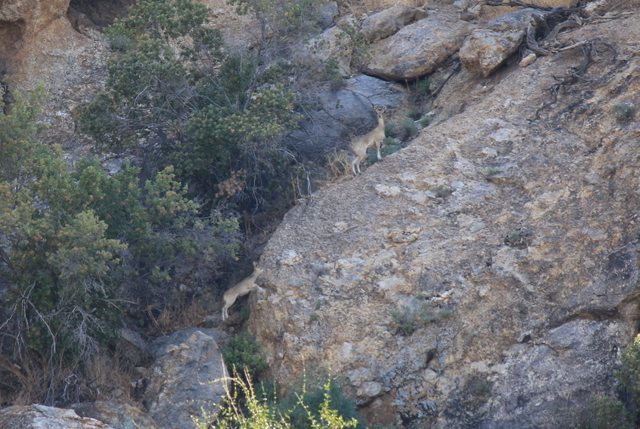 There are plenty of them and good hunting. 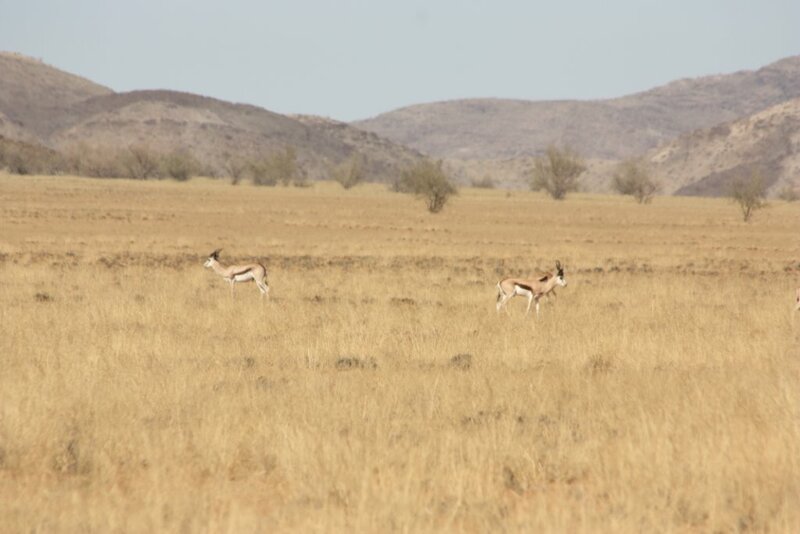 Springbuck on the open plains of Puros Conservancy in Namibia. 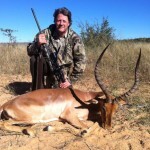 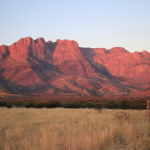 It is one of the areas with the best springbuck hunting. 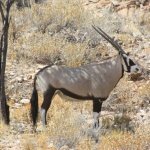 Oryx female from Puros Conservancy, Namibia. 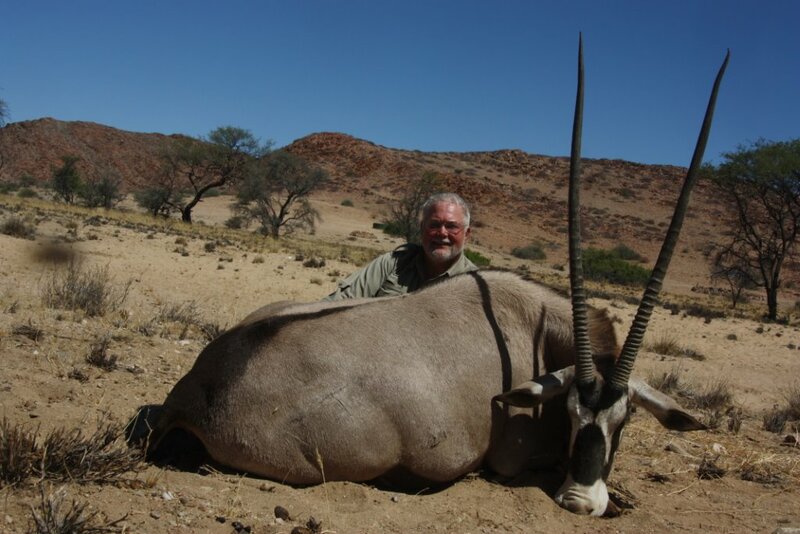 Nice oryx taken in Puros Conservancy, Namibia, after a good stalk. 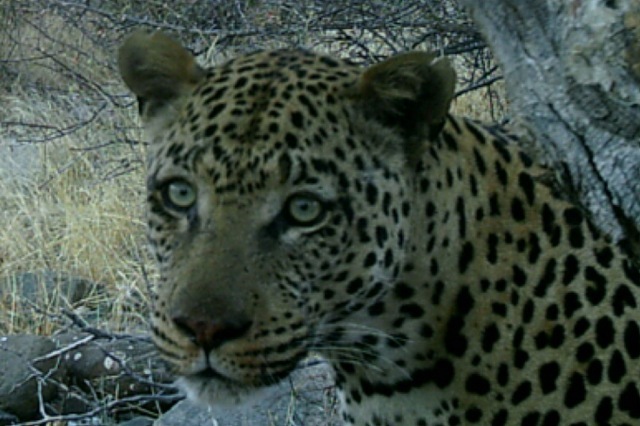 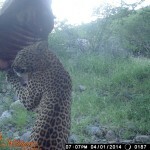 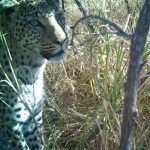 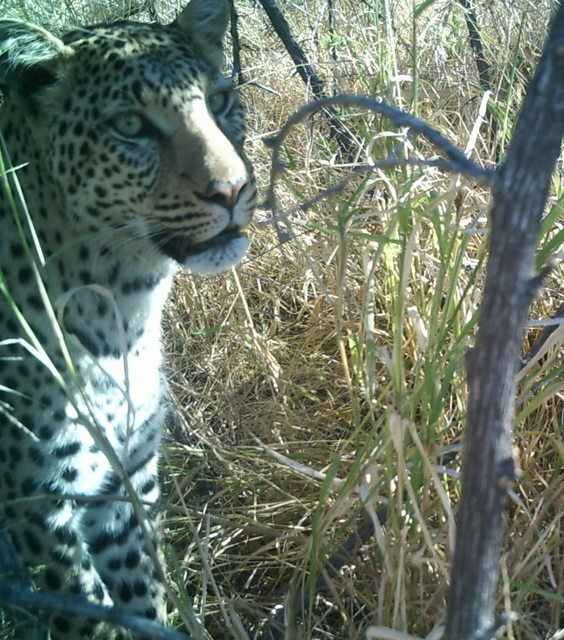 Another daylight leopard in Namibia. 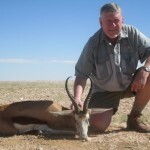 I have hunt a lot even though it has been a wet summer. 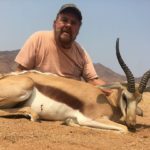 A lot of running around and some hunts in the rain. 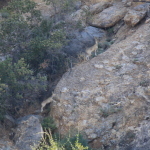 Click each picture to view larger on its own page. 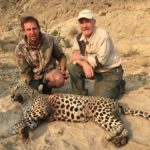 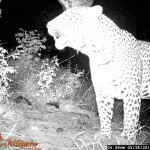 The leopard hunt is still open for this year. 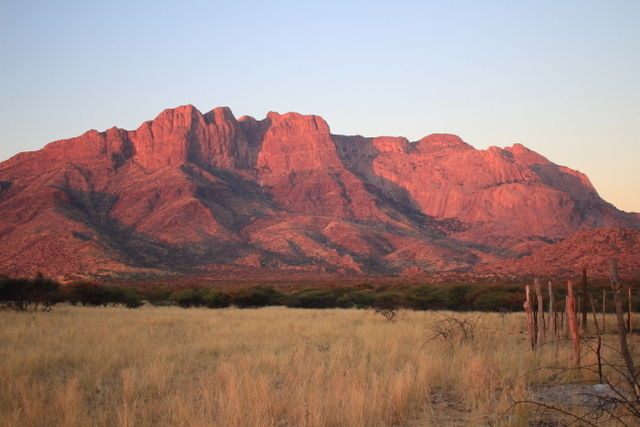 Gaingu Conservancy, Namibia. 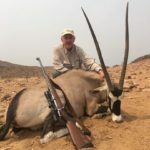 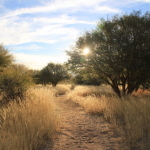 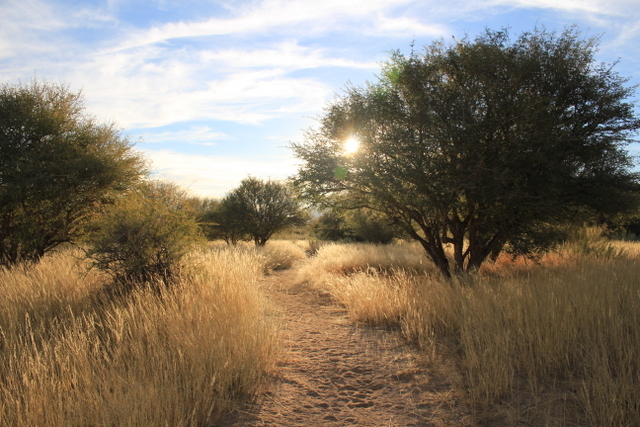 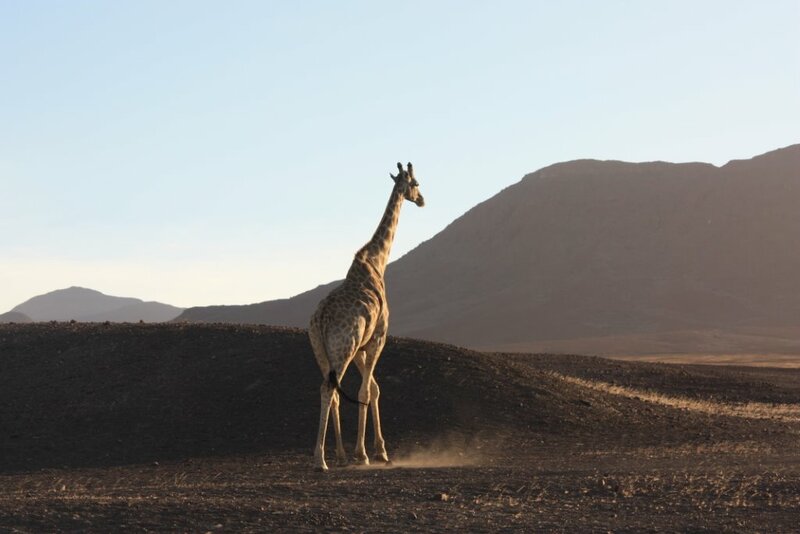 Hunt the Puros conservancy in the extreme north west of Namibia. 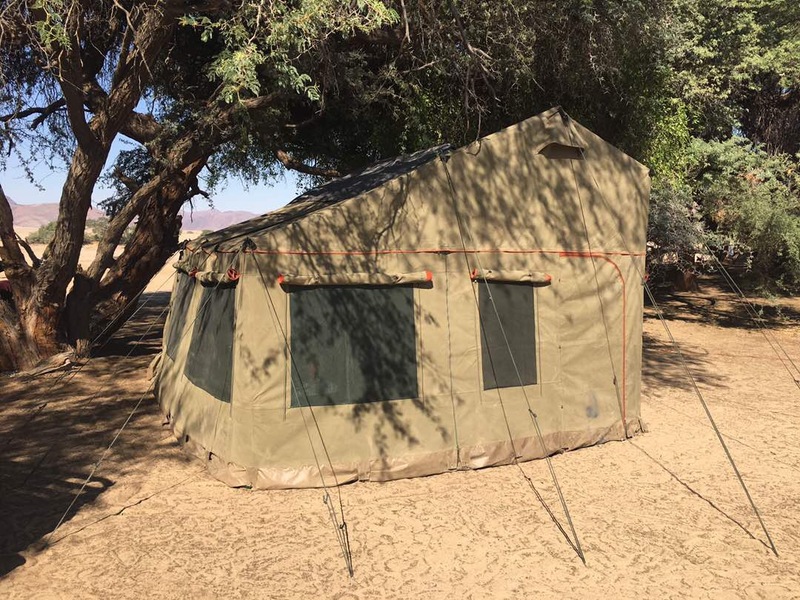 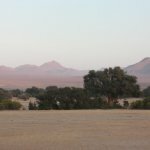 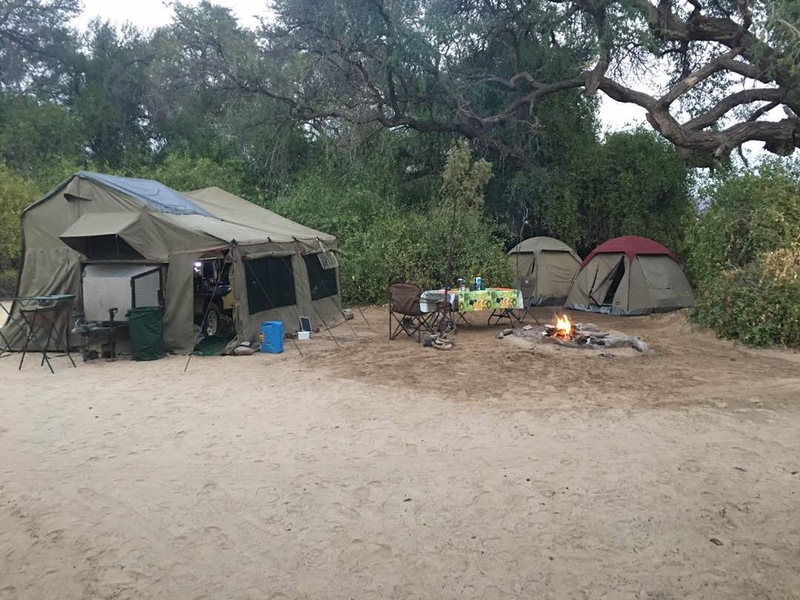 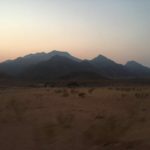 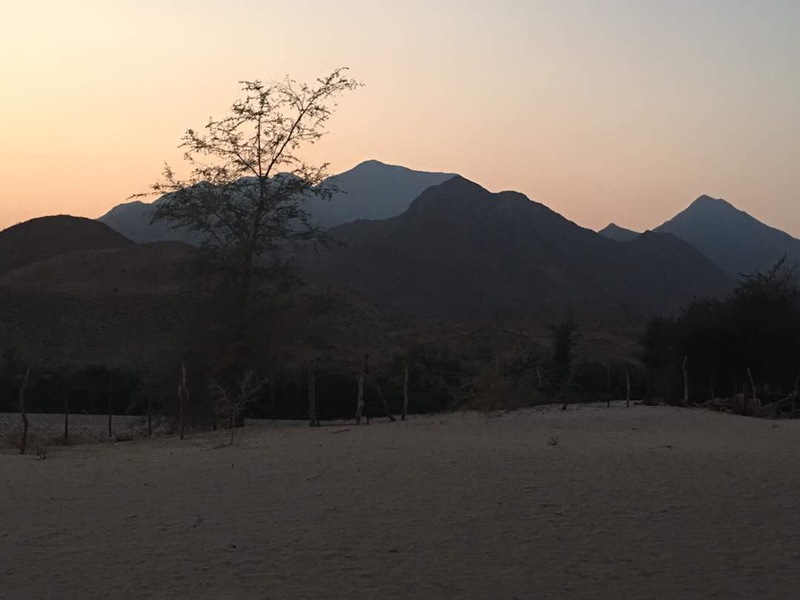 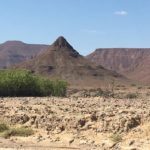 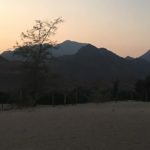 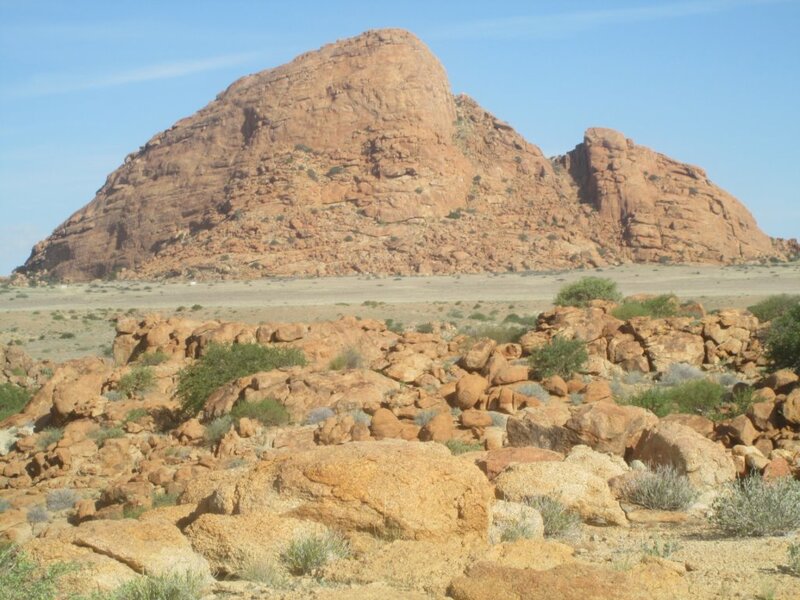 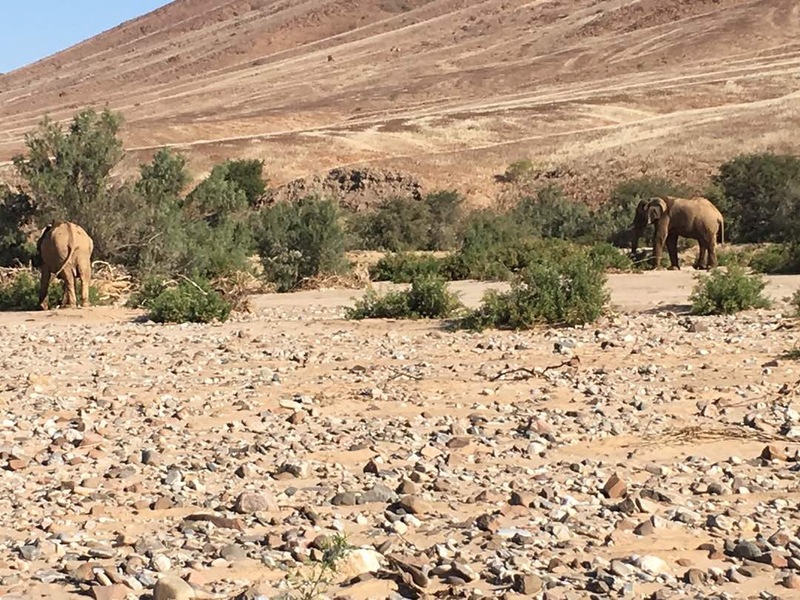 It is one of the best places to do free roaming game and spend nights in a fly camp under the stars of the namib desert. 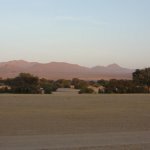 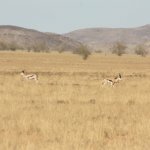 It is the home ground of Springbuck, Oryx, Hartman Mountain Zebra. 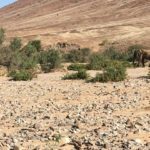 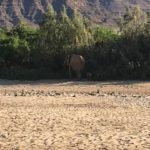 There, you can still see Black Rhino, Elephant and Lion as it was in Africa many years ago and can follow the migration in and out of big dry riverbeds as the season change. 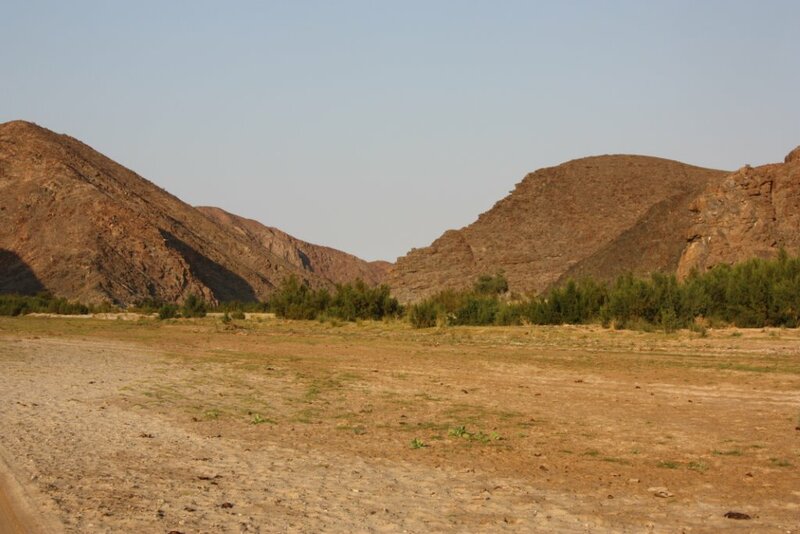 It is a desert area with big open plain with mountains and dry riverbeds that have a fountain (spring) also. 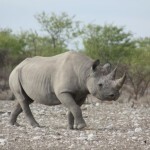 It is a life line that all depend on, and take care of with respect. 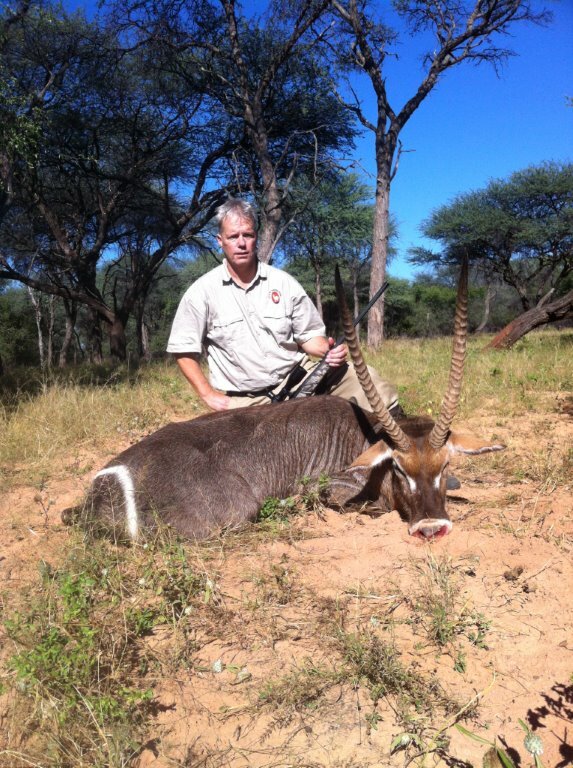 Other game like Kudu and wildebeest can be hunt in one of my other areas. 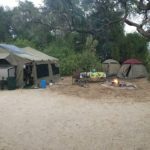 All accommodation, transport, drinks and meals are included. 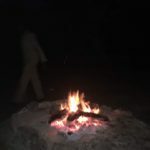 My family is very important to me. 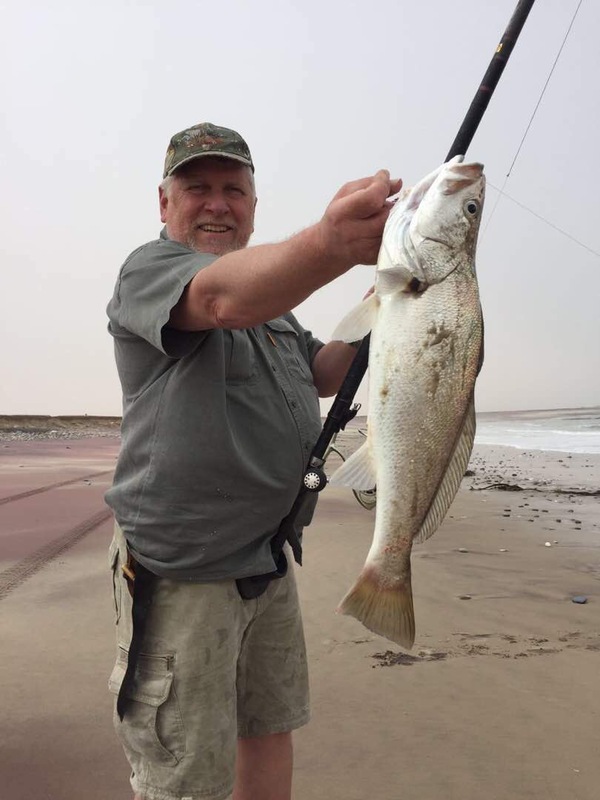 We are all enjoying our move to Swakopmund and being near the ocean. 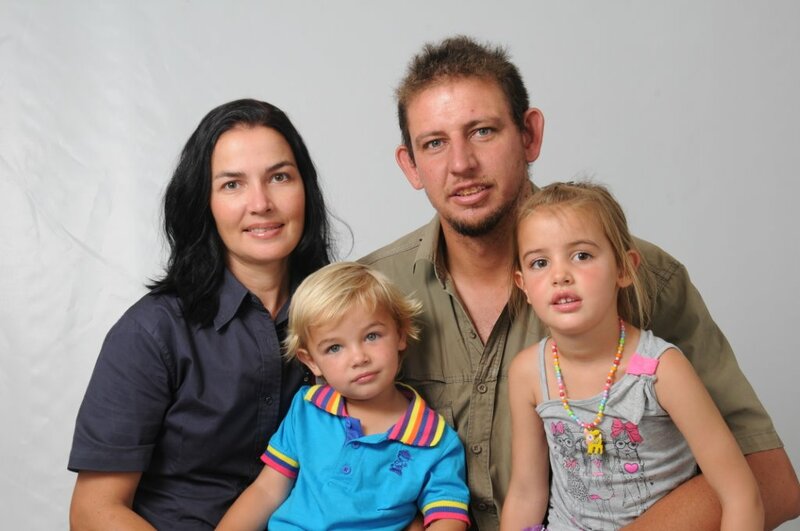 My wife Ronel and our children Geremy and Arizhia. 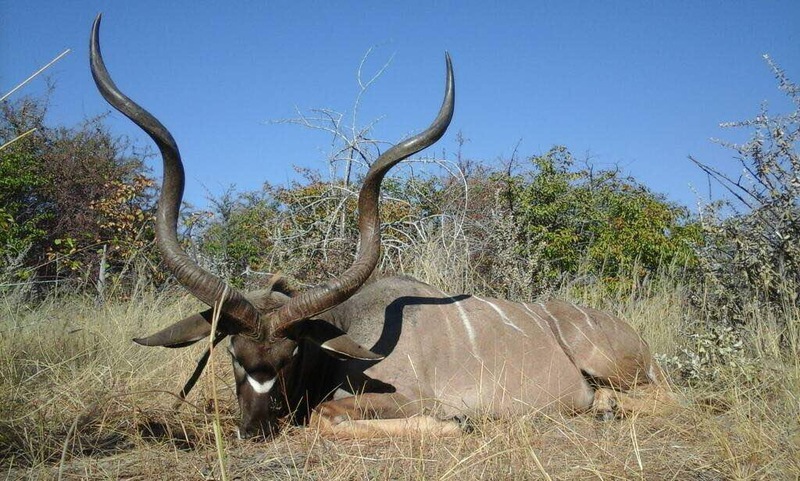 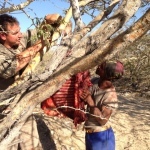 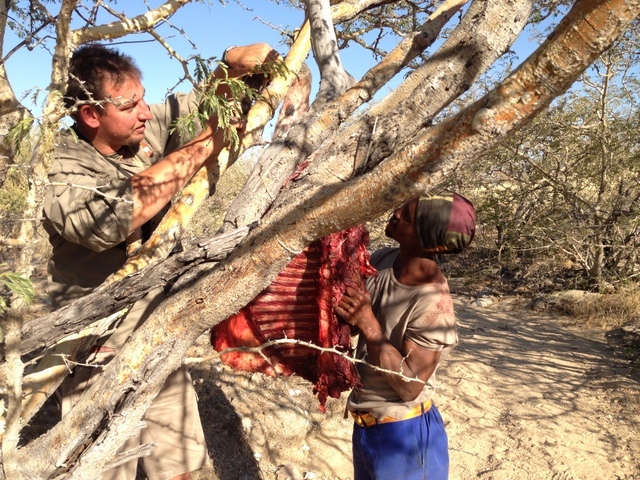 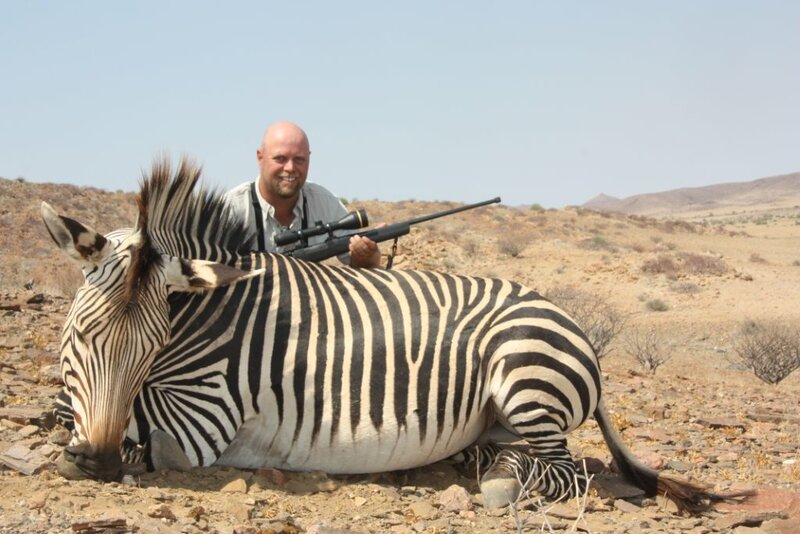 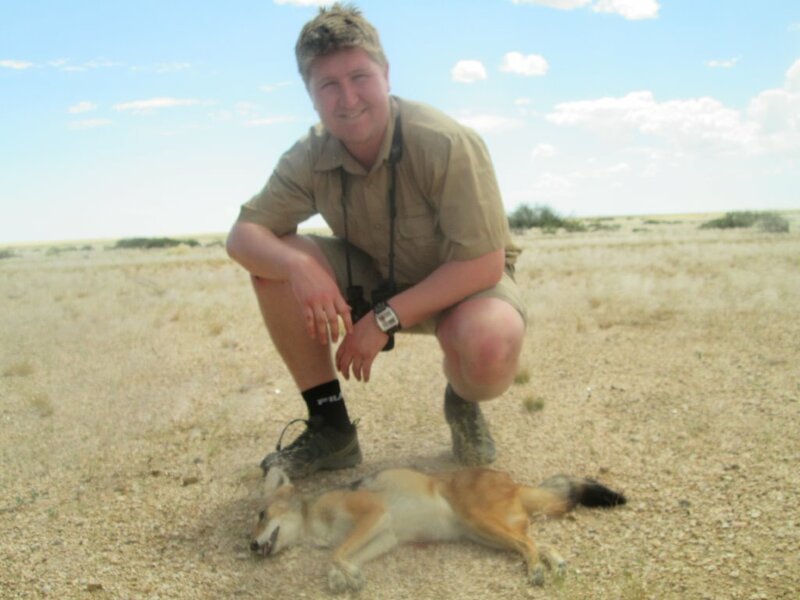 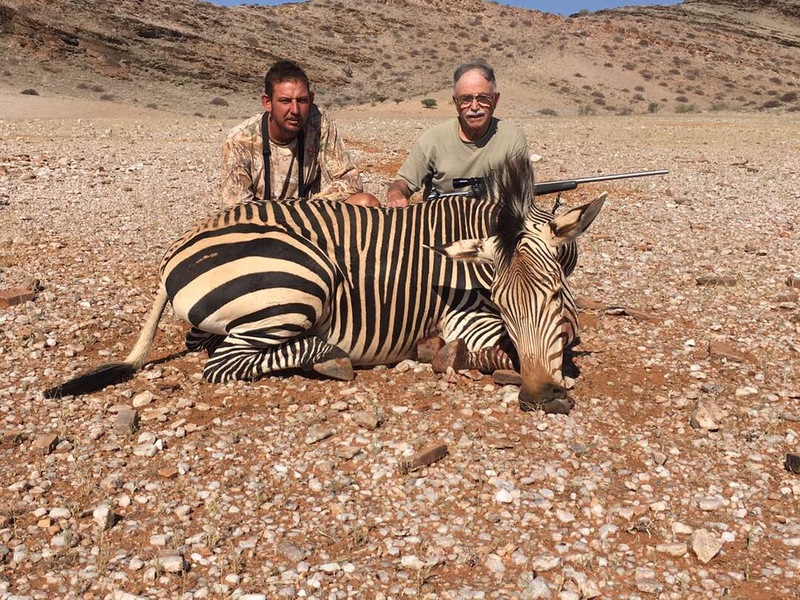 More photos from the 2013 hunting season across Namibia, Africa. 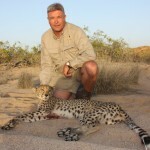 Cheetah sustainably hunted in Gaingu conservancy, Namibia. 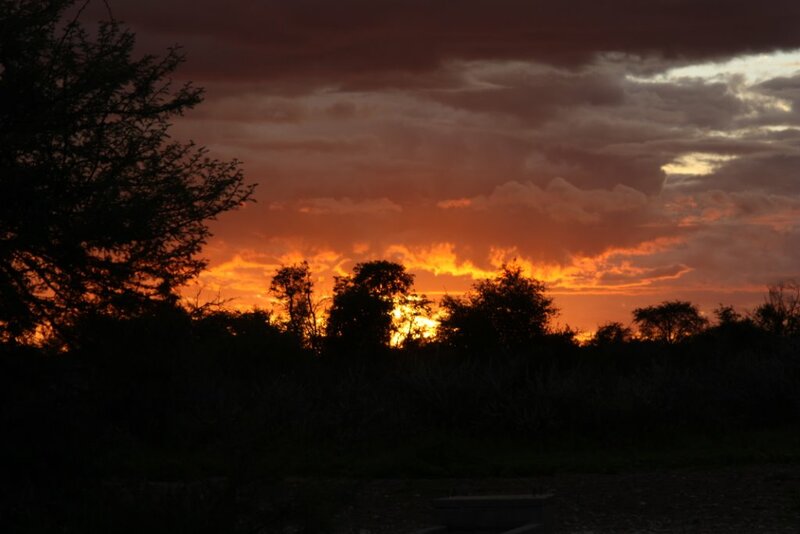 Africa does have the best sunsets. 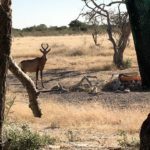 Part of the magic of an African safari is taking time to look around. 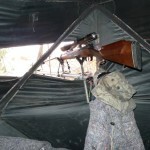 Inside the leopard blind. 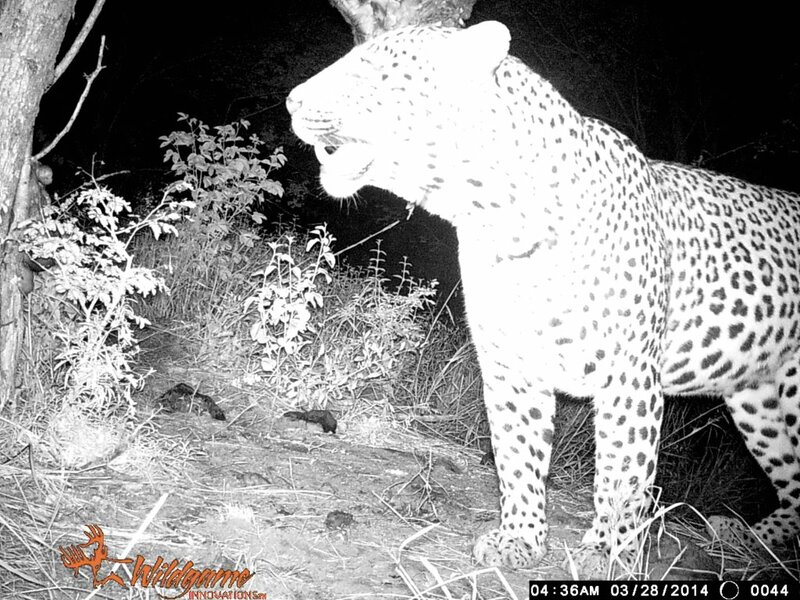 Leopard hunting takes lots of patience.